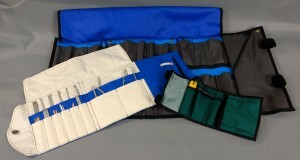 Tool rolls are a handy way to keep the tools you need ready to hand, organized, and contained. There are endless variations on this simple item, and they are pretty straightforward to make. 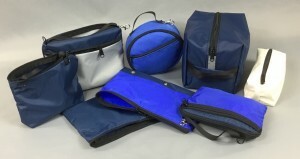 And they’re good for more than just cycling: The same basic concept can be used to carry drum sticks, knitting needles, knives, a set of travel silverware, toiletries, art supplies like pencils and brushes, all kinds of stuff. 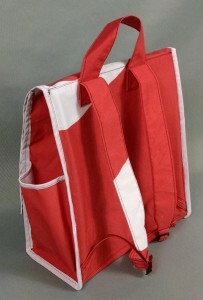 It’s a blank slate that you can fill with whatever slots and pockets you need, then roll up and carry with you. With so many ways to make a tool roll, they can be wonderful, personal, practical handmade gifts for almost anyone. 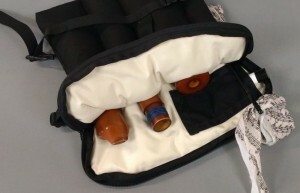 You might not know this, but in addition to Dill Pickle bags, I also make soft cases for historical woodwind instruments, which you can find at www.canzonet.net. 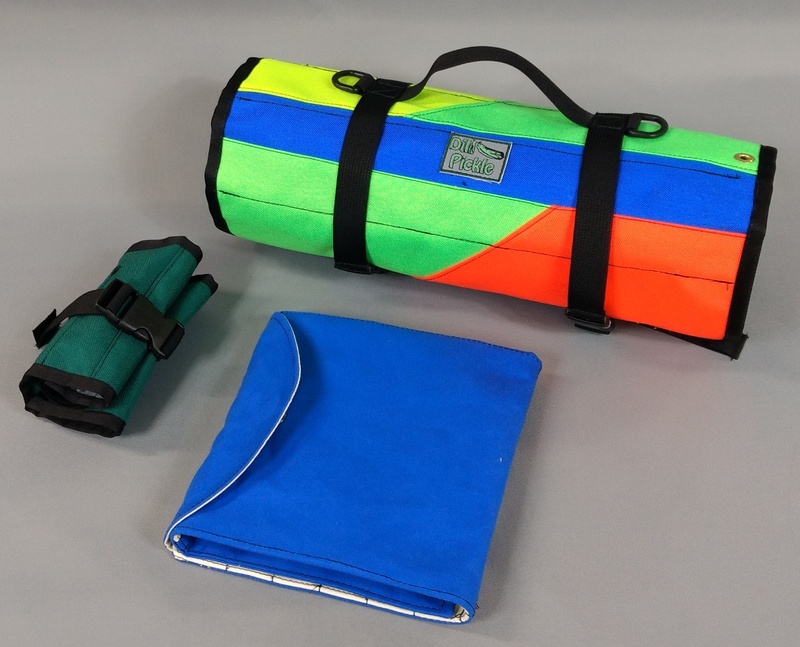 These are basically padded tool rolls, too! There are infinite ways to make them, as complicated or as simple as you like. They can even make a perfect first sewing project! This tutorial will show you how to design your own tool roll to suit your own needs, or exactly how to duplicate the ones I made. It doesn’t cover all the basics of things like zippers and sewing on straps though, because that is covered in last year’s tutorial on luggage and travel accessories (with a whole section just on zippers). So do check back to that one if you’re unsure on any of these steps! As always, I created this free tutorial for your personal non-commercial use. If you enjoy it, please consider making a donation to Days for Girls (www.daysforgirls.org/). They harness the enthusiasm and skills of home sewing volunteers to make washable, re-usable sanitary pads for women and girls in developing countries who otherwise do not have access to feminine products, and often lose several days of school or work per month due to stigmas surrounding periods and the lack of available products to let them get on with their lives during that time. If you have ever wondered, “gee it must be inconvenient to get your period while on a long brevet”, you can imagine what an important but hidden cause this is for millions of women. Please don’t hesitate to get in touch with any questions, comments, or corrections, or just to show off your handiwork! I love to see what people make! 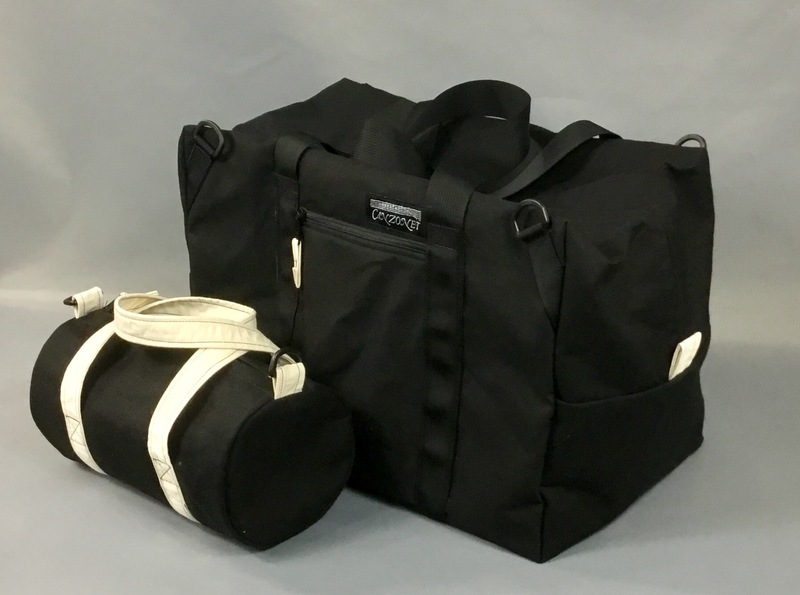 #PickleProject: Travel accessories and zippers and Duffel bags, oh my! Since I didn’t get around to doing a holiday project last year, I’m doing a big one this year. So big that it has morphed into two travel-themed parts that I hope will also work well as tutorials for generally useful skills and inspiration for other future projects. Part 1 has some basics about sewing in zippers (it’s easy! really!!) and making various small bags and pouches that can be great as travel accessories, school supplies, a way to organize your backpack or all those chargers and cords, etc. Part 2 extends the same concepts a little further to make two different styles of duffel bag. These look complicated and fancy, but I promise you they are easier than they look and quite accessible. And the variations are endless. If you look around, you’ll see all kinds of items made basically the same way; from designer luggage to dollar store pencil cases. 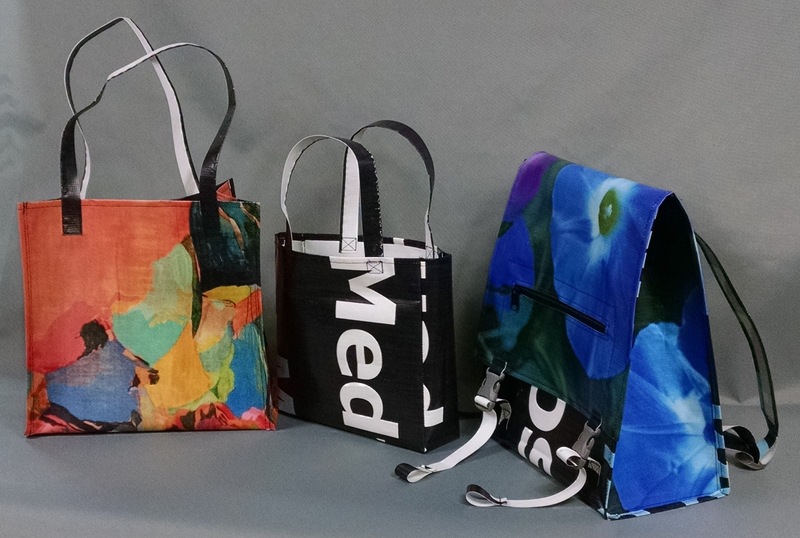 They can be quilted, they can be waterproof, they can be colorful, they can be plain; use cotton, nylon, leather, clear vinyl, or recycled materials. I hope you enjoy these projects! I would love to see what you make. Please don’t be shy about asking questions, or making requests for future projects! As always, I make these tutorials available free of charge for your personal use. 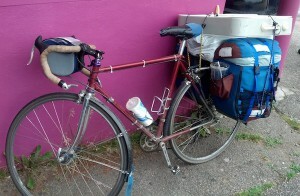 So if you enjoy them, please consider making a donation to a worthy bike advocacy organization. Thanks! Hello Everyone! 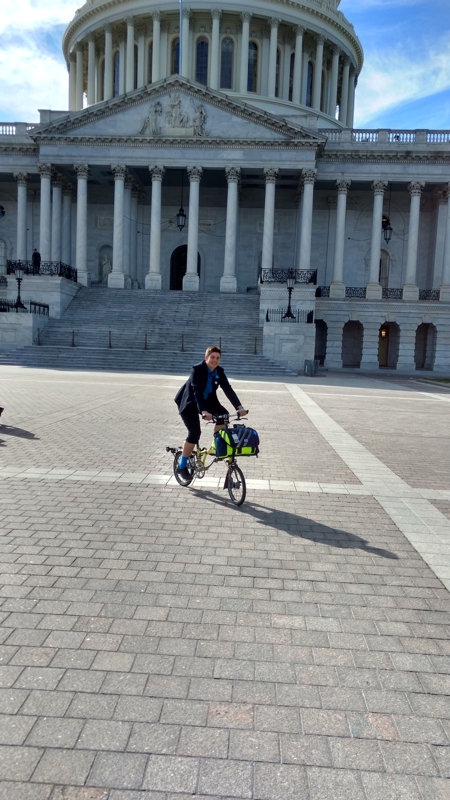 I’m heading down to Washington, DC to represent the Medford Bicycle Advisory Commission (www.medfordbikes.Org) at the National Bike Summit this week. 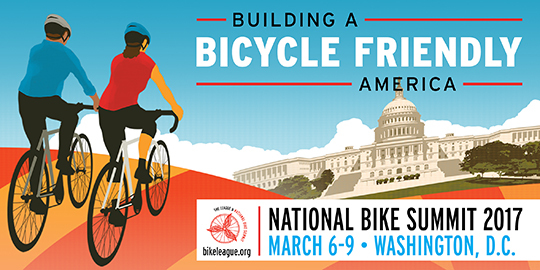 I think it will be a great opportunity to connect with other bike advocates from around the country, and learn about new ways to make bicycling in Medford even better. I’ll keep posting updates here during the week, so keep checking back! 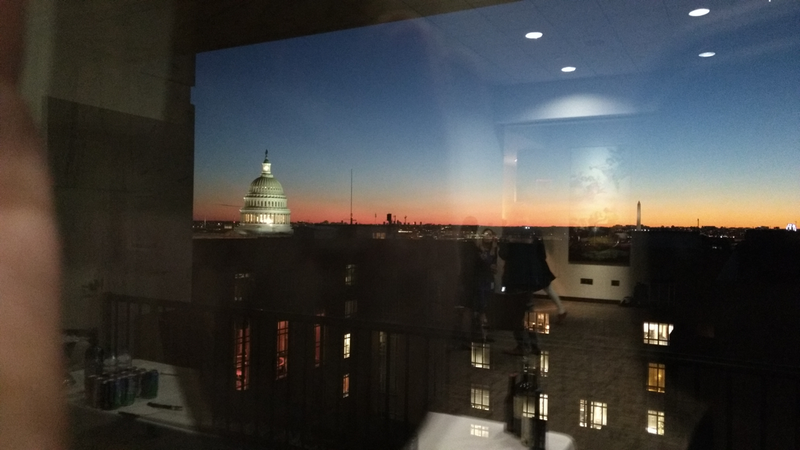 The view out of the 9th floor of the Hart Senate Office Building. 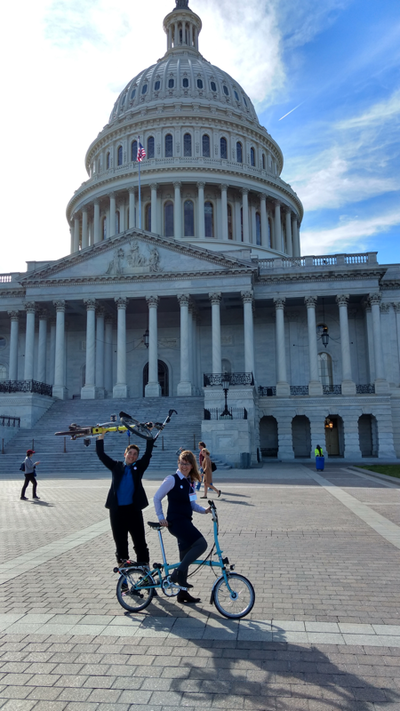 Richard and Lauren from MassBike; along with Becca from BCU, they were really the rock stars of our lobby day. 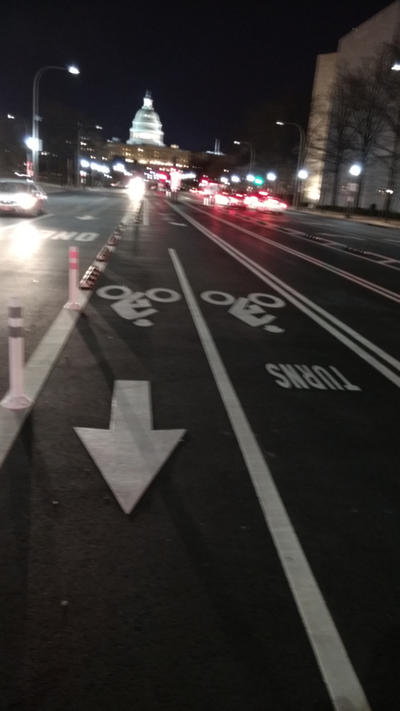 Impressive two-way cycle track down the middle of Pennsylvania Ave. on the stretch east of the White House. It has well thought-out provisions for getting on and off, and making turns – it even has a turn lane! Trip down memory lane. THe building to the right was my high school. 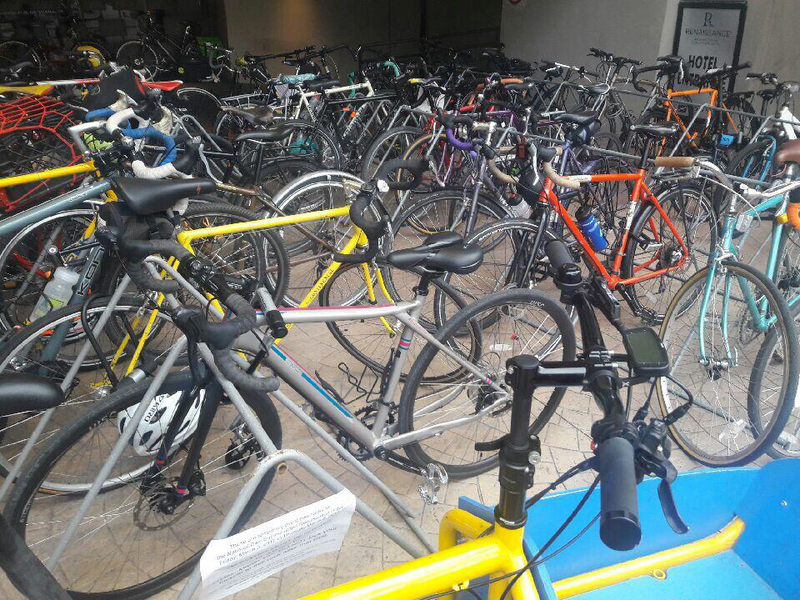 Look at all those bike racks! 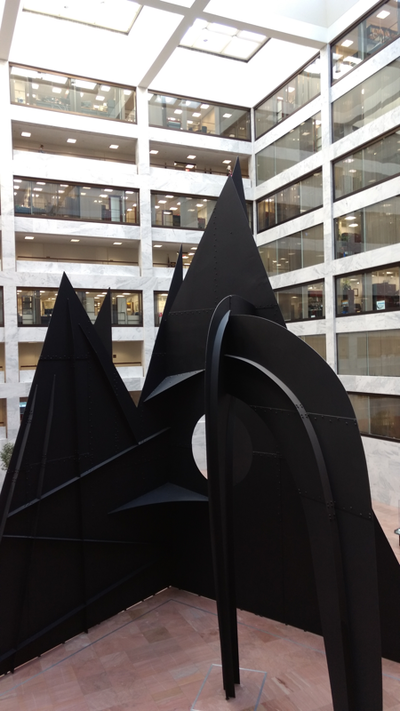 Lobby Day! For today, everyone moved home base over to a church on East Capitol Street, convenient to the offices we were all visiting. 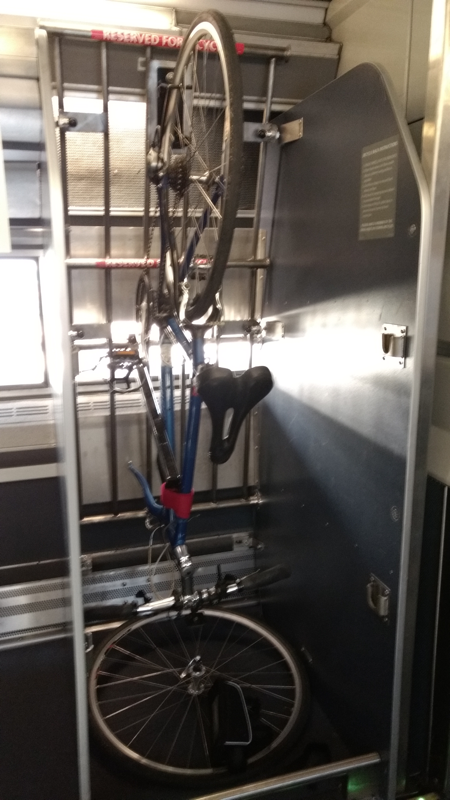 Since I wasn’t scheduled for any meetings until 11:30, I took the opportunity to pop over to Union Station to see Amtrak’s demonstration of the bike facilities they’re rolling out. 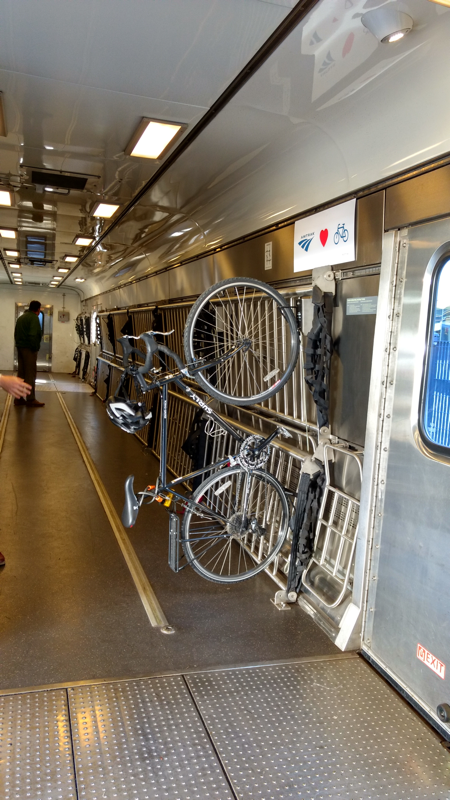 So far there isn’t a whole lot that connects to Boston yet, but they understand how bikes are important for connectivity, and they are working on adding these accommodations to more routes. The Massachusetts delegation were all assigned to visit a few Representatives’ offices apiece, and we all visited both Senators’ offices. 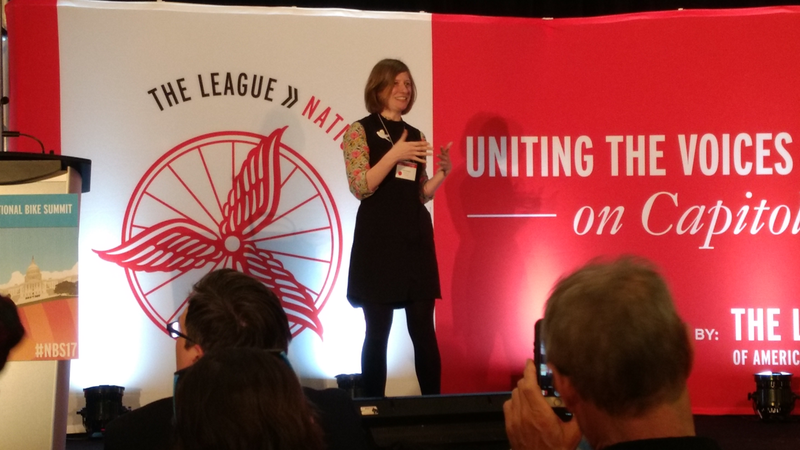 The League provided folders for each office including polling data and economic statistics to support the cause of bicycling and walking, and had specific requests to make of our elected officials – protecting transportation funding for biking and walking projects, supporting the Vision Zero bill currently making its way through the House, and joining the Bike Caucus. In each office we discussed these issues with staff members, and particularly tried to emphasize bicycling as a method of building bridges with colleagues from across the aisle. After all the meetings were over, we had a reception in the Hart Senate Office Building, with a wonderful sunset view. Representative Earl Blumenauer of Oregon’s 3rd district (includes Portland) and Senator Cardin from Maryland both spoke to the group. They’re both working hard to support alternative transportation in general and bicycling in particular. I was pretty tired by the time I left, but since it was actually not all that late I decided to ride by my high school and check out a few other things on the way back to my mom’s house. 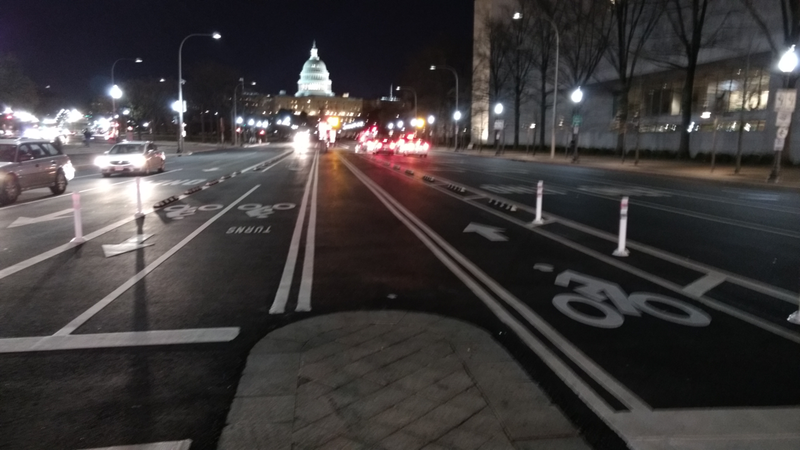 Only at a bike summit would the whole conference be abuzz about a bike lane, but all week I’d been hearing about this new two-way protected cycletrack in the middle of Pennsylvania Avenue, so I had to check it out. It’s really pretty well thought out; it provides for turns, it connects well when Pennsylvania Ave. makes a weird jog at 15th street by the White House and the cycle track ends. It even has turning lanes at the approach to intersections! The section of Pennsylvania Ave right in front of the White House has been closed to cars for many years, but you can still bike and walk across it. However, once the traffic resumes on the other side, the cycletrack is gone. 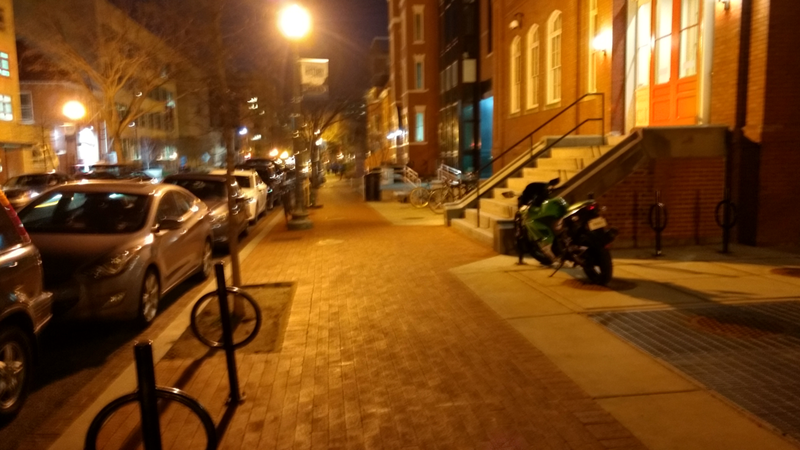 From there I hopped a couple of blocks over to G street, to ride by my high school. When I went there, only a small handful of kids rode bikes to school, and we locked our bikes to a railing out back. But the school has since been renovated with a new wing added; and it has bike racks all around the front! I’m curious how full they are during the school day! Today started bright and early, with a plenary session at 8 AM, although fortunately there was plenty of coffee provided! 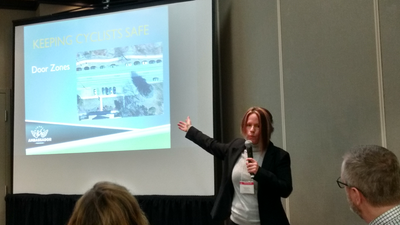 We heard a presentation about the future of smart intersections, autonomous vehicles, and what that might mean for bicycling and walking interests. Next up was a time slot that had multiple sessions in it that looked really interesting; I wished I could have been in two places at once! But since I can’t, I went to one about raising state and local funds for biking and walking projects, and state legislation and funding. We heard about the importance of building coalitions between multiple stakeholder groups, and making the case to state legislators for why these projects are important for their districts. The four panelists discussed the work their groups have done in their states, what they learned along the way, and what they would have done differently. It was a great oportunity to learn from the successes and pitfalls others have encountered during this process. 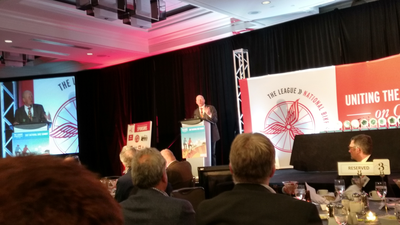 Over lunch, we heard more about other programs the Bike League runs to help make biking better for everyone: Bicycle Friendly Communities, businesses, and universities. 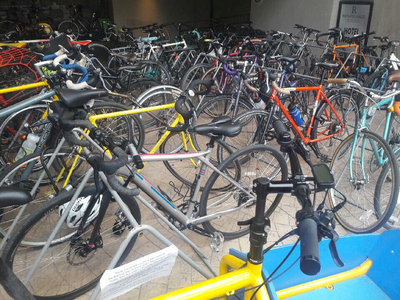 These progams work both as incentives to improve conditions for cycling, whether it’s infrastructure or bike racks or workstands and repair facilities; and also as ways for the League to see what strategies are being used in different places to help develop best practice recommendations. After lunch I attended a session given by Jamie Gaskill-Fox about a program she developed in Fort Collins, CO to educate motorists about safely sharing the roads with cyclists, called “Bicycle Friendly Driver”. I have to say that this session might just be the single most valuable thing I have attended this week. 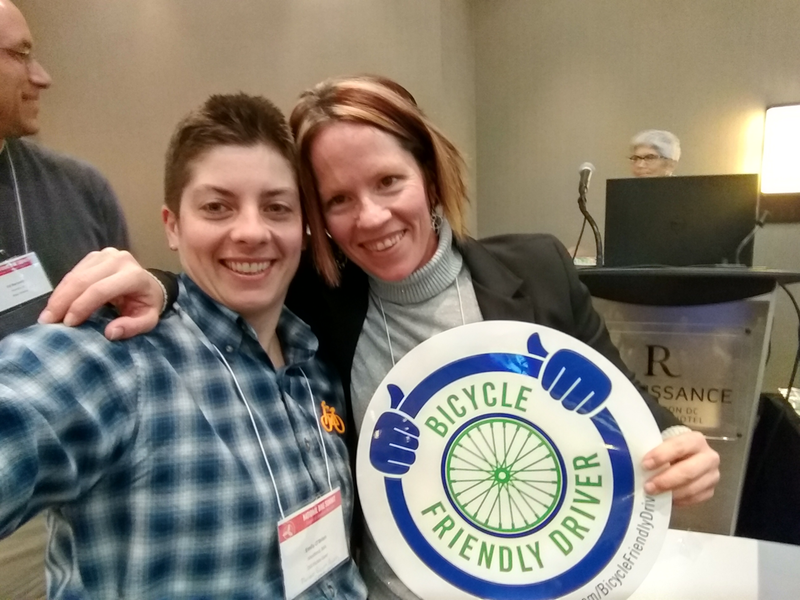 The program is centered around a 90-minute class to teach motorists about how to handle encounters with bicyclists on the road, and how to best use the road infrastructure as it currently exists (rather than just wishing for more bike lanes in the future). The class concludes with a test, and participants who pass receive stickers and certificates. Not only did Jamie tell us all about how she made this program successful in Fort Collins, she has also made it freely available online, complete with a detailed curriculum and step-by-step instructions on how to implement this program, customize the examples and situations and data for our own communities, get started teaching the classm and market it to businesses, schools, and other groups. This is something we could run with in Medford with the resources that we currently have, to reach people we aren’t reaching now and make the roads safer and more comfortable for everyone. 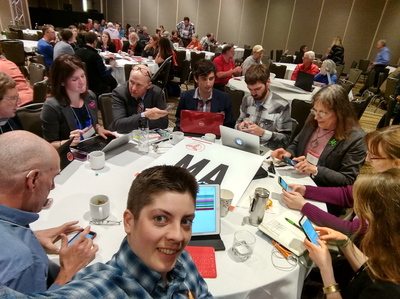 Lastly for today, everyone got back together to plan for tomorrow when we meet with the Senators and Representatives (and/or their staff) from our states. Caron Whitaker and Ken McLeod went over the materials the League has provided including information about the Vision Zero Act (H.R. 1266); data about the job creation case for funding the construction of bicycle facilities; and polling data about public support for biking and walking projects. Then we got together with the rest of the attendees from our states to discuss the logistics of meeting with our elected representatives tomorrow. I’m looking forward to the day! 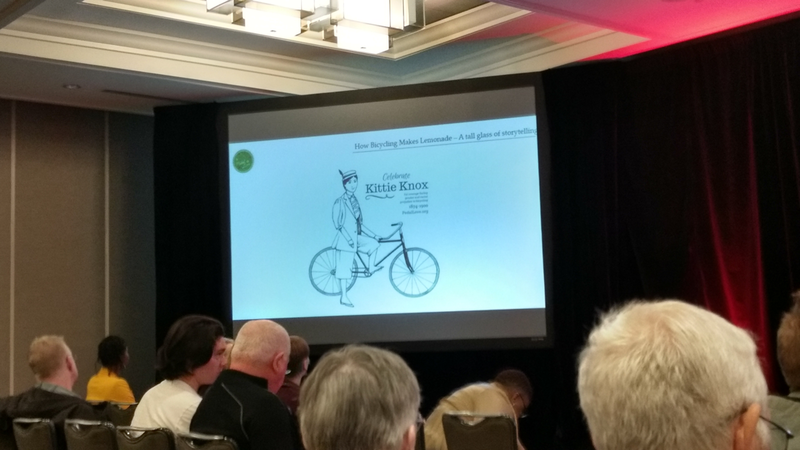 Kittie Knox was a Boston bicycle pioneer around the turn of the 20th century whose story was rediscovered by Lawrence Finison in his research. This morning started the day by re-living a bit of high school! Since I’m staying at my mom’s house and the Summit venue is not too far from where I went to school, I’m riding in on a lot of the same route. 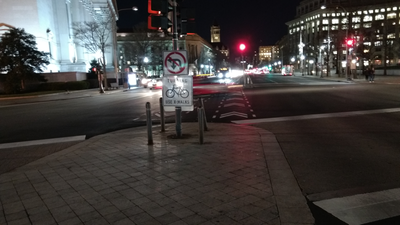 But it’s been awhile; DC had no bike lanes back then at all, and lots of things have really changed here. But other things really haven’t; in high school, I rode a lot of this route on the sidewalk believe it or not, which I *never* do in Medford. But in DC it’s legal in many places, and the roads I’m taking have some parts where traffic comes to a standstill and other parts where it goes by fast with no room for safe passing. So I found myself going on and off the sidewalk at various points, which was what I saw all the other cyclists doing too. So I guess some things haven’t changed after all! 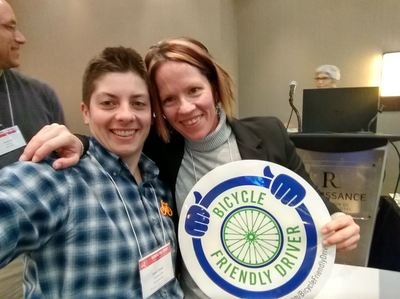 The first session I attended today was for first-time Bike Summit attendees. It was a good chance to get oriented, figure out how things work, and connect with other first timers. 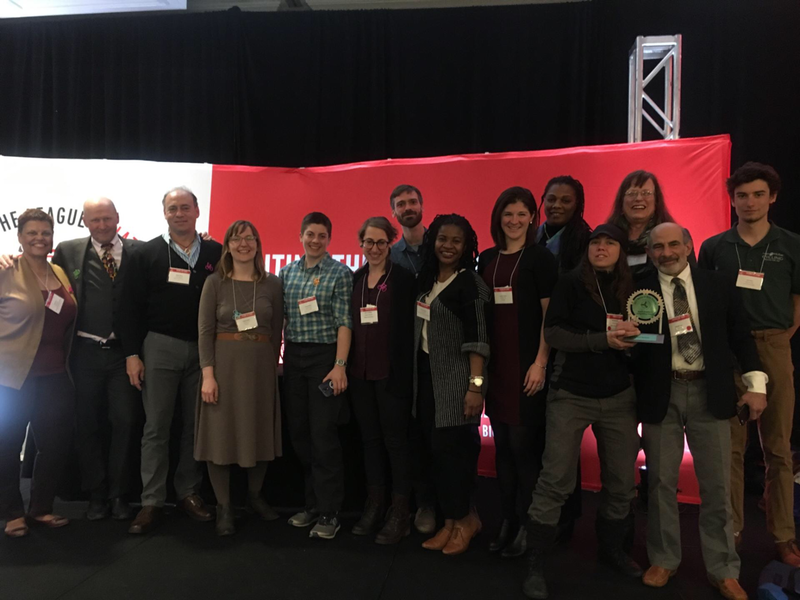 I’m finding that attendees come from all different corners of the advocacy world – some work in public health, some are involved in planning, some are involved in outreach. They all seem to really share a commitment to making cycling safe and practical (and fun!!) for everyone in their communities, not just the people who consider themselves “Serious Cyclists”. The afternoon started out with a session focused on the power of storytelling to change hearts and minds. A common thread to many of the stories we heard was people who started cycling as adults after thinking for years that they couldn’t do it, and finding that it transformed their lives to the point where they became passionate and committed advocates for the cause. Also here for the Summit are a number of vendors and sponsors, with a variety of products and projects to exhibit. My friend and studio-mate Bekka is here with her “Bikeyface” comic books. 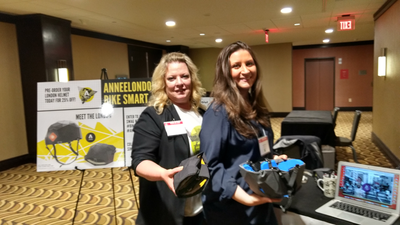 There’s AnneeLondon, a startup working on a collapsible bike helmet, that meets all the same safety standards as the familiar styrene foam ones but folds up into a small, convenient package. There are a couple of bike rack manufacturers. There’s LoveToRide, which runs bike challenges and marketing campaigns to help businesses and communities worldwide encourage more new riders. There’s Elly Blue, whose book “Bikenomics” makes the economic case for biking. There are a couple of small cycling clothing companies. Neat stuff! In the afternoon, I attended a session given by Caron Whitaker about lobbying Congress, which we’ll all be doing on Wednesday. We learned a lot about how Congressional and Senate offices work and the importance of the various staff that help the legislators evaluate policy and write bills. But lots of what she had to say was actually really useful for trying to persuade anyone to support bicycling and walking causes. 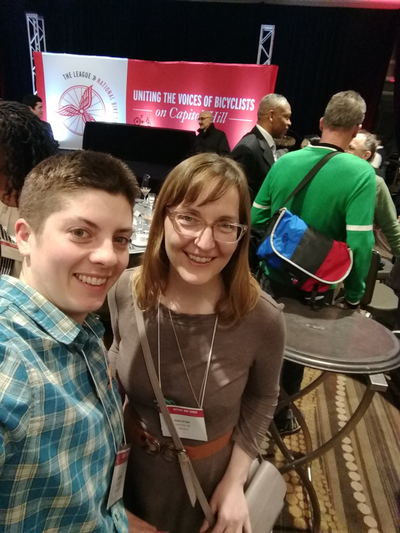 She discussed finding out what motivates members, bringing in specific success stories from the member’s constituency, and discussing how bicycling fits in with a community’s other priorities (such as business development). The last event today was the awards dinner, where the League honored some amazing people with incredible stories who have made exceptional contributions. It was really inspiring to hear about all the things these people have done to help the cycling community, both locally and nationally. 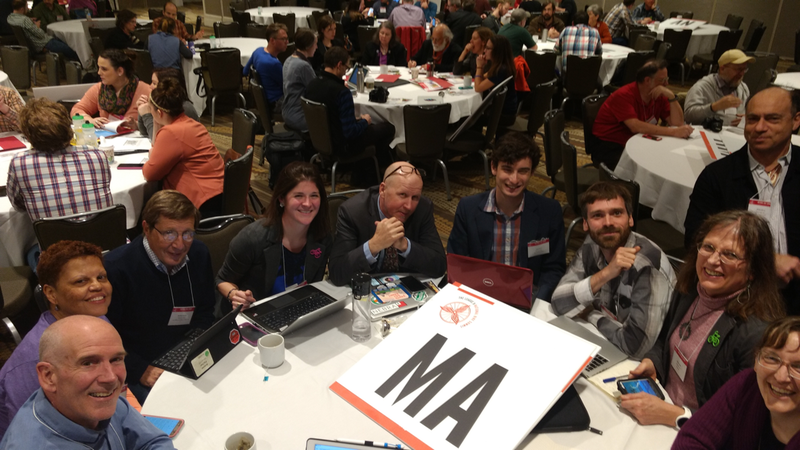 I sat at a table full of other folks from our figurative back yard – Mattapan, Dorchester, Roslindale, as well as some MassBike folks. I hope we can coordinate with some of these folks in the future too! 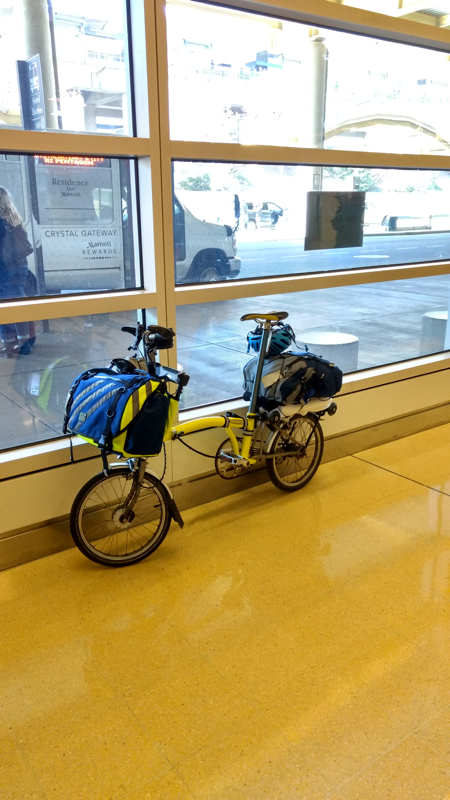 I flew into National Airport with a folding bike, which made it really easy to just hop on and ride over to the venue from the airport. The Mount Vernon Trail is a nice paved multi-use path that conveniently connects National Airport with the downtown area of DC. Although I grew up here, things have really changed a lot! There are lots of bike lanes, some protected lanes/cycle tracks, and lots of sharrows. And there are lots of really neat bicycle-oriented wayfinding signs with distances and directions to points of interest. The first event was a little mini-tour of the area immediately around the summit venue, plus Capitol Hill. 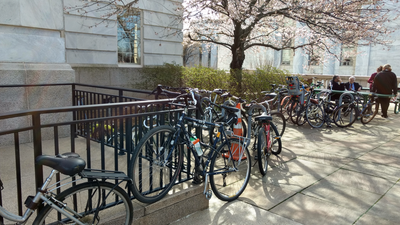 Some riders had brought their own bikes, some rented bikes, and some used the Capitol BikeShare bikes (like Hubway in Boston). After that was the LAB’s annual meeting and reception. The annual meeting had a long Q&A session where we got to hear more about the League’s activities and programs. 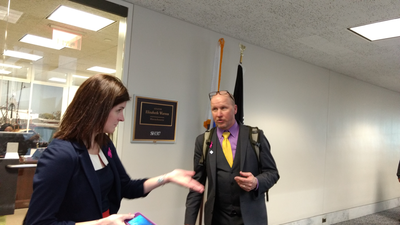 I met a couple of other attendees from Kansas who work in public health, who told me about some of the various groups they’ve involved in their outreach efforts, a guy from the DC area involved in the same kinds of long distance events that I help organize in New England, and other activists from all over the country. Tomorrow will be a full day! As cyclists, we spend a lot of time in the outdoors. We love the fresh air and the scenic countryside. We may not all have the same feelings about the outcome of last week’s election. But I hope we can agree that whatever the choices made by the incoming Congress and President, the outdoor environments we love are worth protecting. So for this month, we’re raffling off four of these Dill Pickle Gear shop aprons to benefit the Sierra Club and the incredible work it does to defend against an incoming administration whose top priorities include dismantling existing protections of air, water, wilderness areas, endangered species, and global climate change. The aprons are made of pre-washed high-quality cotton denim with a variety of pockets of various sizes. 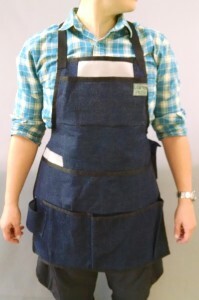 Each apron has two places where the pockets are reinforced with vinyl so they can hold up against sharper items such as scribes, mechanical pencils, cable cutters, etc. They have comfortable 1″ straps that cross in back instead of pulling on your neck, and they buckle with adjustable side-release buckles. As you can see, there is a shorter version and a longer version, and there are two of each. I’m the one in the picture, and I am about 5’6″, to give you some idea of how the sizes look. Raffle winners will get their pick of short or long in the order of the drawing. Raffle tickets are $5 apiece, with no additional purchases necessary. 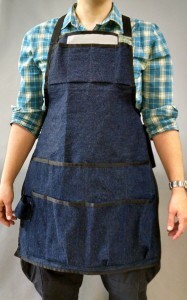 The drawing will take place on December 15 and aprons will be shipped promptly to the winners. All proceeds will go to the Sierra Club, which is perhaps the most influential environmental organization in the country. Its programs range from advocating for legislation at the state and national level to doing the everyday maintenance of trails in our back yards. Last summer, a music workshop I was a part of shared camp with a group of Sierra Club members who were spending their vacation doing just that – working to build and maintain trails in public parks, picking up trash, and controlling invasive species. If you had to pick one organization whose efforts extend from picking up trash in a state park to holding polluters accountable for the damage they cause to promoting the development of renewable energy, the Sierra Club would be it. Raffles are fun and all, but please don’t let it stop you from giving directly, either. If you want to make your own tax-deductible donation, you can donate to the Sierra Club Foundation here. Please donate what you can; environmental damage is not something that can just be repealed later. Destroyed habitats and rare species do not just grow back, and climate change doesn’t reverse itself, just because someone got sued for it later. Dill Pickle will be running some similar event on a regular basis from now on. We’re interested in your ideas! This time around the beneficiary is a large national organization, but if there is a small local group you’d like to recommend, please do. I’m horrified and appalled at the direction this election has taken. I apologize if that offends anyone, but I hope it doesn’t surprise you. Part of me wants to hide under the covers and cry. But instead I’m going to take action. I want to start a regular charity benefit through Dill Pickle, aimed at the causes and the people that I believe will be the most adversely affected. At the top of my list are climate change and other environmental issues, and issues pertaining to discrimination and harassment against women, non-Christians, people of color, and immigrants. I don’t yet know what shape this will take, but I am thinking of making special items on some regular basis to auction or raffle off, and donate the proceeds. These may be large items or small, standard products or special one-off’s. Maybe sometimes it will be a bunch of small things instead of one big thing. It could also just be a voucher for the bag of your choice. I would love to hear your thoughts. I am also interested in your thoughts about people or organizations that have the most immediate impact on people’s lives or environmental causes. Is it better to donate to a large national organization, where the money is a drop in the bucket, or is it better to donate to a smaller, more localized effort where the same amount of money makes a bigger impact? At present, I think I’ll rotate through a new organization on a monthly or bi-monthly basis, in order to help gain visibility for as many of them as possible. So, please let me know your thoughts. I want to get something going very soon. It’s finally here, the 2015 Pickle Project! This year’s free pattern isn’t exactly a pattern – it’s more like a formula, or a recipe. Previous free patterns have all been for items small enough that the pattern pieces can fit on normal paper that you can print out. But this year, the project is a backpack or tote bag. Those won’t fit on letter-sized paper. But fortunately, the structure is very simple, and they can be made entirely out of three rectangles of material. The “recipe” will tell you everything you need to know to cut the pieces the right size for whatever size or shape of bag you want to make. It will work for a toddler’s preschool bag, and it will work to carry your groceries and beer home. This project is a great way to repurpose old tarps and banners, but it also includes a list of places you can buy new materials as well. 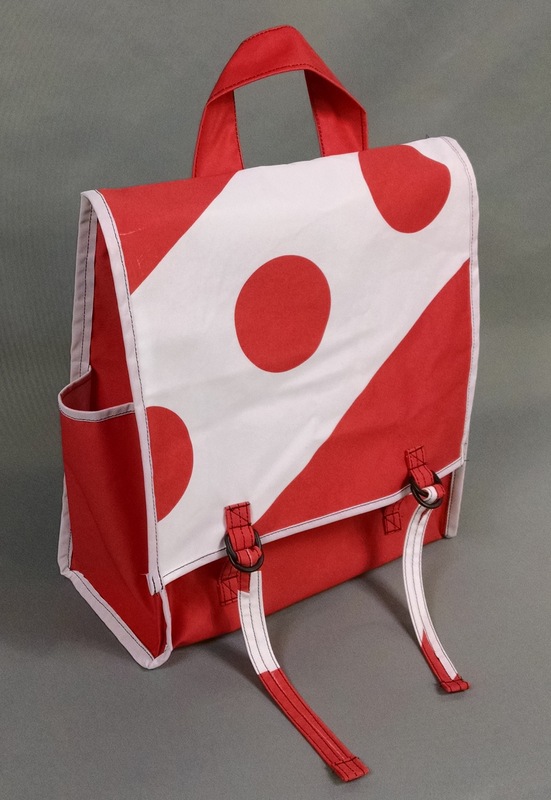 They make great gifts for cyclists and non-cyclists alike. 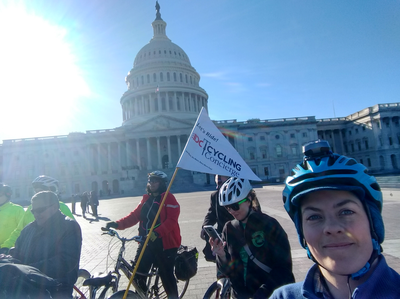 This tutorial is available for free, but if you like it, please consider making a small donation to a worthy cycling advocacy organization. This was a giant banner with the Saucony logo on it. Preschooler-sized backpack for my nephew. As always, if you have any questions please don’t hesitate to ask. If you ask them in the comments, then other people can see the answers too. I’d love to see what you make! 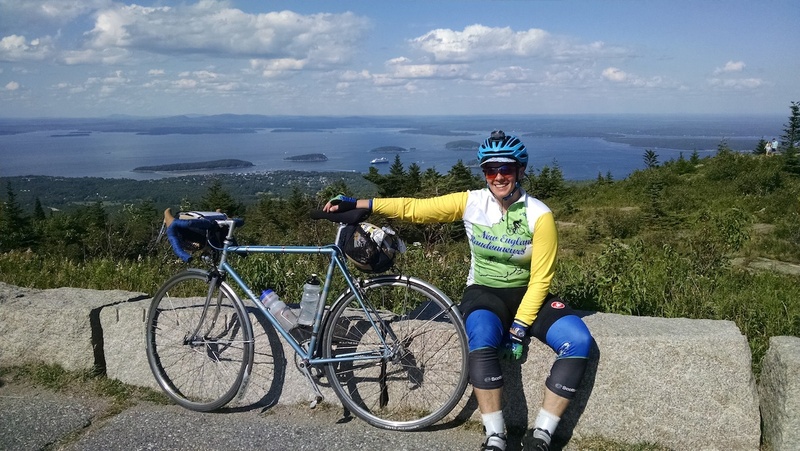 The Downeast 1000k was a new route this year, created by Anthony Mennona and run by our local club, New England Randonneurs. First of all, I want to say a big thank you to Anthony for designing the route, arranging accommodations, and organizing the whole thing; another big thank you to my better half Jake, who’s the RBA for our club and who also put a lot of work into making it happen; and lastly a thank you to all the ride volunteers whose friendly faces greeted me at so many controls. 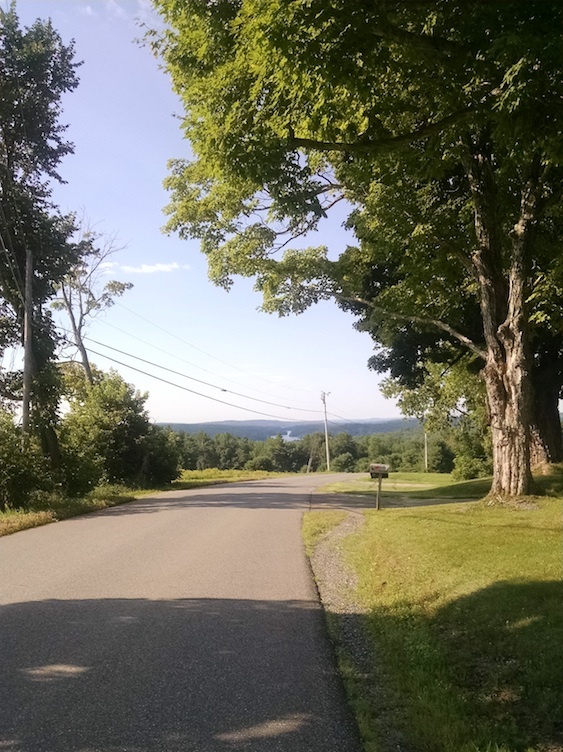 The route started just outside of Montpelier, VT and went out to the Maine coast, with the turn-around atop Cadillac Mountain on Mt. Desert Island, in Acadia National Park. The sleep stop was in a dorm building at Colby College in Waterville, ME. I should mention at the start that in ten years of randonneuring in New England, I have been hoping to see a moose on a ride, and up until now, I never had. Everyone said that if one were going to see a moose on a ride, this would be the ride to see it! 21 riders started, at 4 AM from the Comfort Inn parking lot. The Comfort Inn was wonderful to us, and opened up the breakfast room for us at 3AM so we could get some food and coffee before the start. 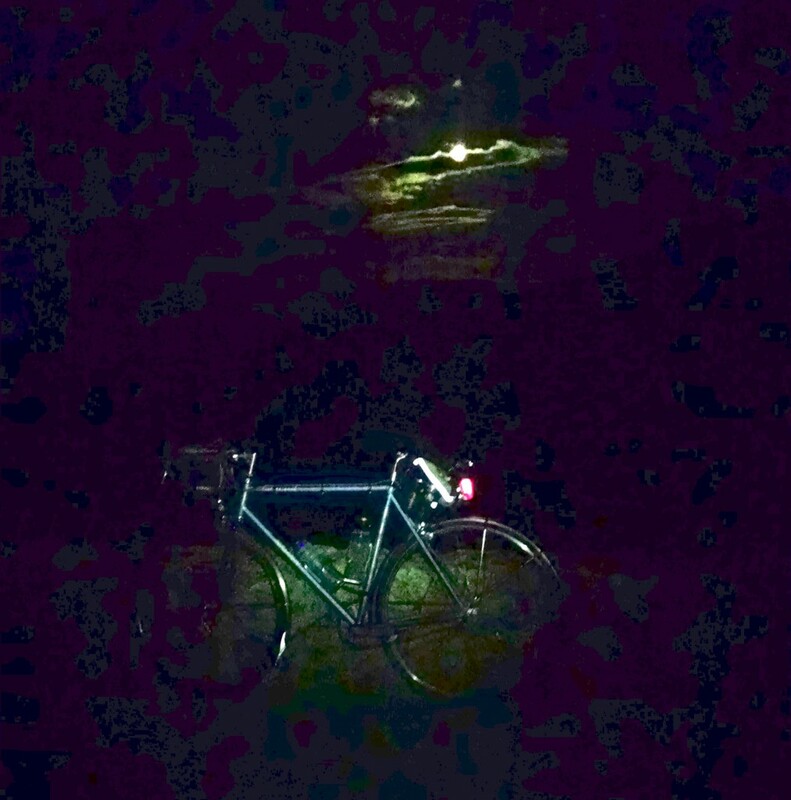 As usual, I rode my old faithful fixed gear, a 1974 Raleigh Professional. I was pleased to see that there was actually one other rider on a singlespeed (although not a fixed gear). 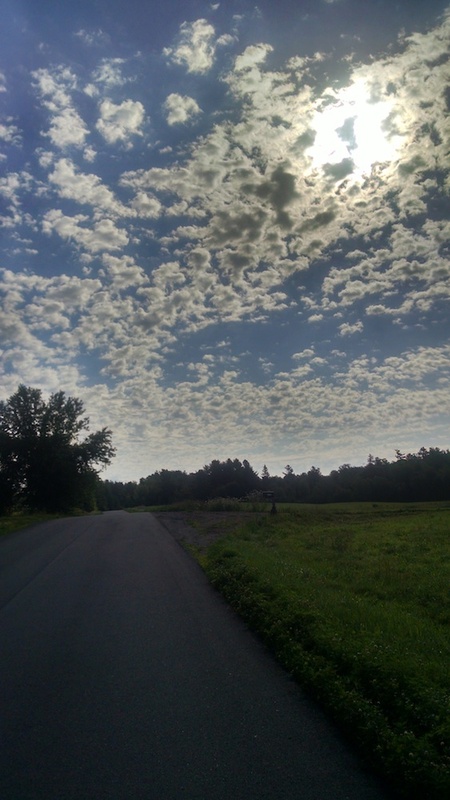 The ride started out across scenic Vermont countryside as the sun came up. I chatted awhile with the other singlespeed rider, until he dropped me on a climb. The morning was humid, but the temperature was pleasant. It was one of those days where between humidity in the early morning and sweat during the heat of the day, my clothes pretty much stayed damp for the entire day. 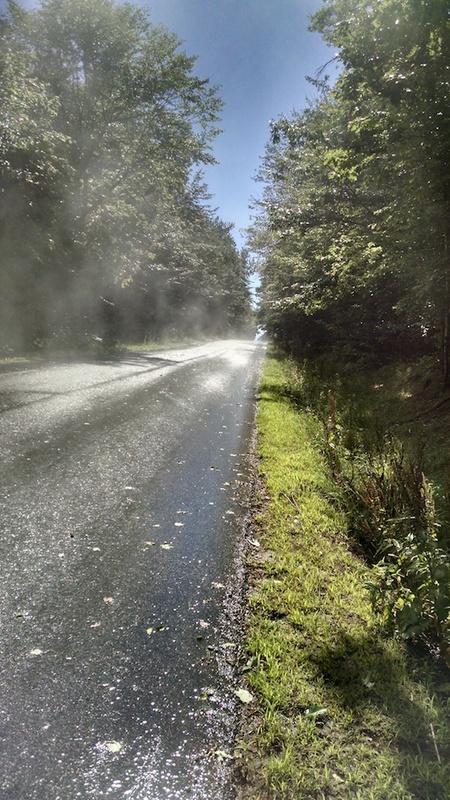 There were a few sections of dirt roads, and overall the pleasant, scenic cycling one expects from Vermont. I started the ride feeling somewhat groggy and tired, and didn’t really feel warmed up for a good while (actually, not really until the third day) but that’s how it goes sometimes. 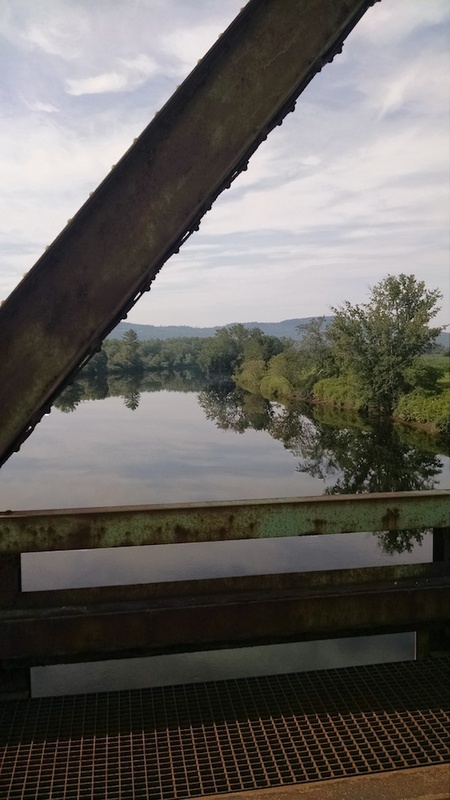 Around mile 60, we found the Connecticut River, which is much smaller than it is in Central Massachusetts. 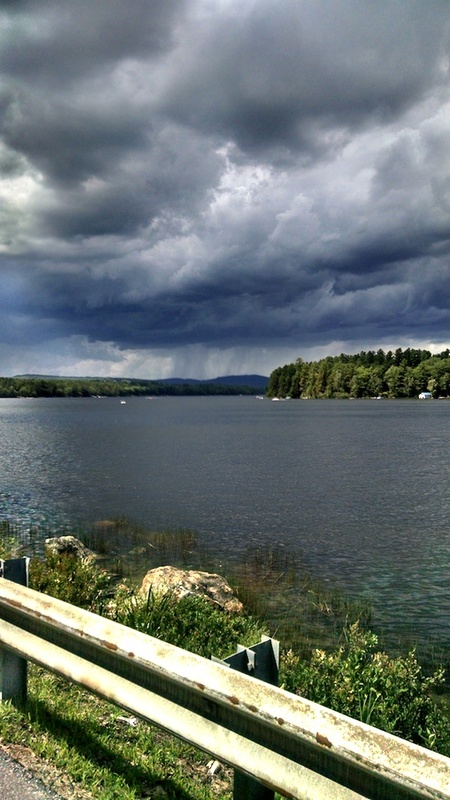 It meanders around and forms the line between Vermont and New Hampshire. We crossed the river into the first control in Lancaster, NH. Anthony was waiting there to sign cards. Between the terrain and the fact that I’m not really at my fastest this year, I think I was the last to arrive at the control, although I got there in good time. There were two riders still there, Mike Anderson and Larry Midura. They’d arrived maybe 10-15 minutes ahead of me, and left maybe 10-15 minutes before I did; that would turn out to be the pattern for most of the rest of the ride. I ate a pickle, filled my bottles, bought a snack, chatted with Anthony for a few minutes, and got back on the road. 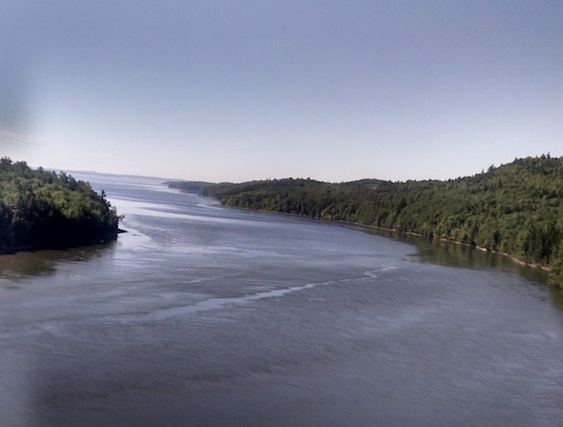 The route followed the Connecticut River north for awhile, then turned more northeast toward the Maine state line. The cuesheet recommended stopping for water in Errol, NH, since there would be no more services for awhile. Mike and Larry had gotten there a bit before me, and they left a bit before me, yet again. 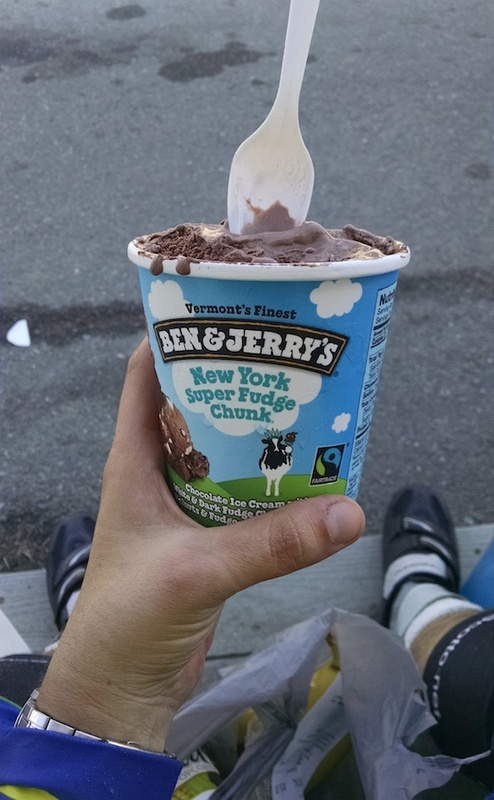 I got in some calories in the form of a nice big ice cream cone, then continued on into Maine. The next stretch was, as promised, empty of services. It went between lakes and marshes on one side, and forest on the other. The pavement was brand-spanking-new, and minimally traveled. 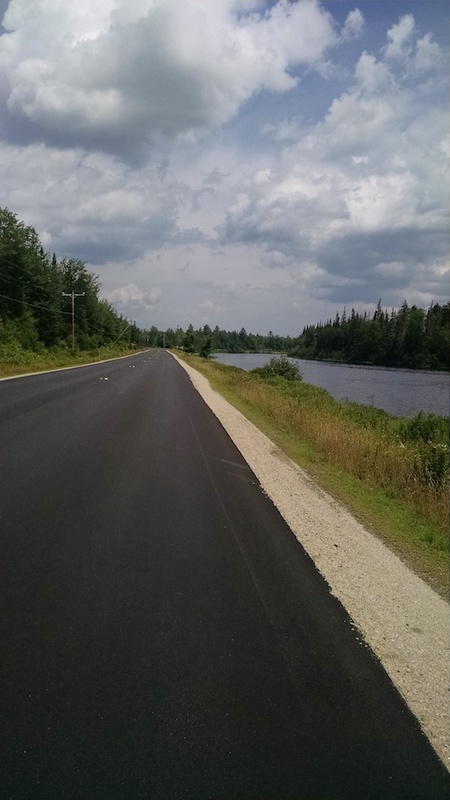 In Maine, state highways and numbered roads are usually one lane in each direction with the paved surface ending an inch past the white line, and a very soft sandy shoulder. On this brand new road, the pavement was perfectly black and the shoulder was light colored sand, which made for beautifully clear tracks on the road surface. Looking around, I kept thinking that this would really be an ideal place to come looking for moose, but of course they probably wouldn’t be out in the heat of the day. There were quite a lot of very clear moose tracks all over the road though, and in one place there were even some bear tracks. There were a few human footprints too, but those were less exciting. For that whole stretch, my biggest regret was that the route doesn’t return that way. I figured if we went that way on the way back, I’d be almost guaranteed to be there at a different time of day, and it was clearly a popular moose hangout. That was a fairly long stretch with no shade, but the scenery was just absolutely gorgeous and the road surface was buttery smooth. It made for a very enjoyable ride. 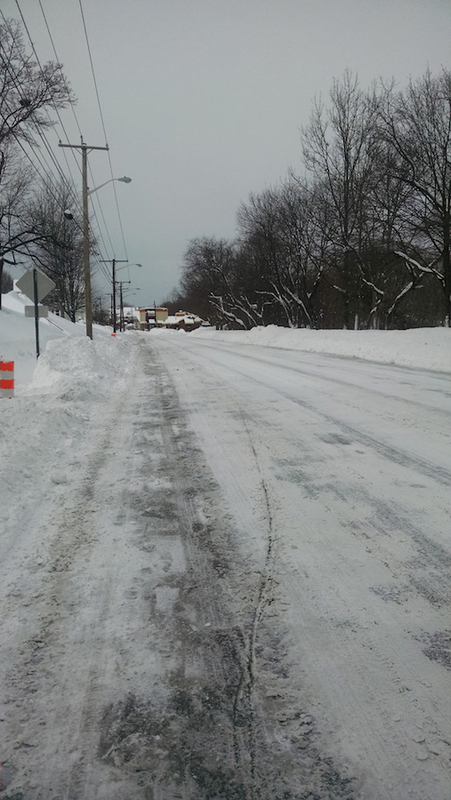 Eventually the road diverged from the lake side as it headed toward the next control in Rangeley, ME. It was on this stretch that I managed to incur what Jake dubbed the “stupidest cycling injury ever”. On rides like this, I like to keep a bottled beverage (preferably caffeinated!) In the side pocket of my saddlebag where I can reach it while riding, in addition to my water bottles. In this case, it was one of those Starbucks Frappucino things, in a glass bottle with a metal lid. 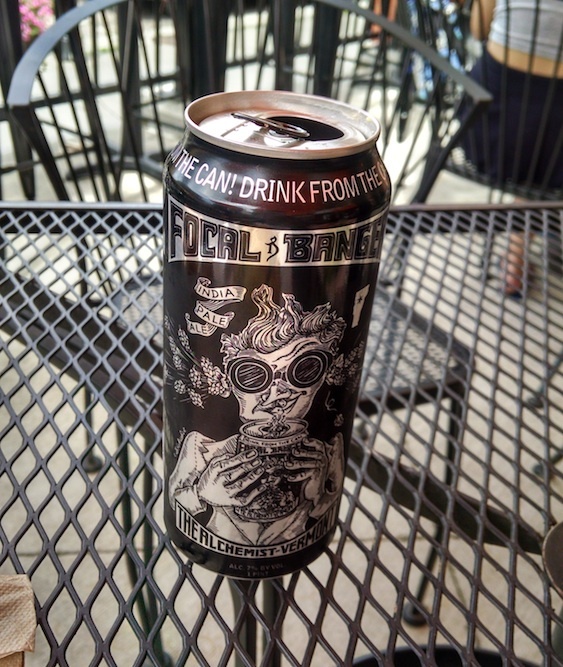 Drinking it requires riding with no hands while I reach back for it, use two hands to open the lid, hold the lid while drinking, and screw the lid back on. At some point, I’d taken a drink and been annoyed that the bottle was dribbling sticky all over the place, and screwed the lid on good and tight. So on this stretch, I reached for the bottle and tried to open it, but I couldn’t get the lid open. I got annoyed and just gave it a really good crank as hard as I could, and felt a sudden pain in the back of my right forearm. It was one of those things where you know you’re about to do something that’s going to hurt, but you’re annoyed and you just do it anyway. The lid still didn’t come off. I wasn’t really thinking about my arm, I just wanted the stupid lid off. So I tried a couple more times. I tried tapping the lid against the stem (although, not wanting to leave marks on my stem, not actually hard enough to help). Still no dice. So I gave up on it, since I wasn’t even that far from the control anyway. 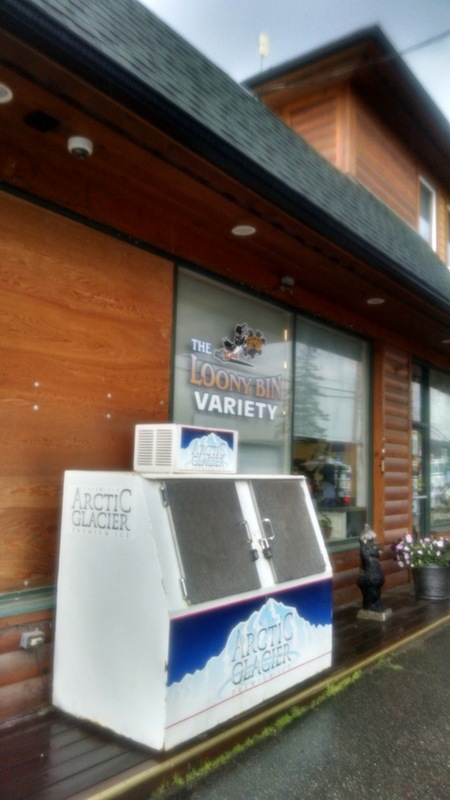 The control was a convenience store called The Looney Bin, which strikes me as aptly named for a control on a crazy ride like this. The selection there was unfortunately a little thin, but it sufficed. Henry van den Broek was there to sign brevet cards, and Mike and Larry were there too. My bottled Starbucks was passed around and remained stubbornly closed until Henry tapped it against something a few more times and got it open. As I was getting ready to leave, the sky opened up. I hung around the control for a few more minutes until the rain died down, then got back on the road. The rain petered out, although the weather remained damp. The Looney Bin: that place where randonneurs probably all belong, by definition. It was sometime in the damp evening in the river and pond-dotted hinterlands past Rangeley that I saw my moose! I looked up and she was just standing there by the side of the road. I slowly rolled to a stop just past her as she looked around nervously, ears twitching. She was pretty close, actually. But while she seemed OK with me rolling past, she didn’t much like me standing there trying to surreptitiously get my phone out for a photo, and she disappeared into the brush before I managed it. She was the only one I saw on the whole ride, but still, I was thrilled to have seen her if only briefly. Once it was dark, it got fairly foggy at times, which caused me to miss a turn at one point because I didn’t see the sign through the fog. But I didn’t go too far off course and was able to correct myself. For what it’s worth, I’ll mention that I was riding basically just using the cuesheet. 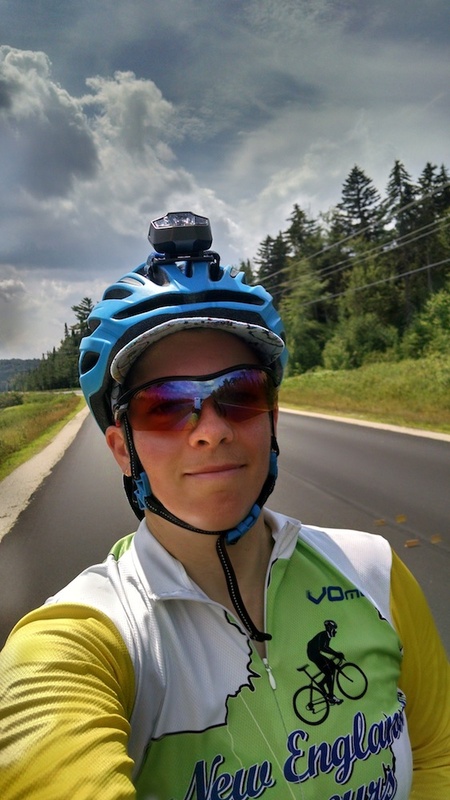 I did have a GPS along in my handlebar bag – Jake’s newer one, which doesn’t fit on the handlebar mount for mine… I didn’t bring mine because I hadn’t gotten around to loading the route on it, but Jake offered me his, which he’d loaded the route onto. So the GPS was basically for verification purposes. I had my cell phone as well, kept in airplane mode to save battery, which I could also pull out if I needed it. But mostly I still tend to use cuesheets, especially in New England where our ride organizers work very hard to make them clear and informative. And the cuesheet has more information in it than the GPS would, anyway – such as where to find a convenience store .2 mi off the route that you wouldn’t otherwise know was there, if you need to refuel. Actually, having a GPS along but not mounting it to the bars, or having it on the bars but without the route in it, or having it along but not bothering to put fresh batteries in it, etc, are all sort of common, ummm, “strategies” for me, as I tend to take a sort of casual and last-minute approach to packing for rides, and I know I’ll be handed a cuesheet at the start. So, following the cuesheet’s instructions, I made a brief stop at the barely-off-route convenience store, and continued on to the sleep stop at Colby College in Waterville, ME. Actually, on my way into the college, I even pulled out my cell phone to find a campus map, since I hadn’t seen the street name the cuesheet mentioned, and it looked like I’d passed most of the campus buildings already. Because of course, neither the GPS nor Google Maps marked the actual street names of the campus roads, or the names of the buildings. But the dorm we were using was just a little further on, and I found it with no further trouble. The accommodations at Colby were excellent. I arrived at 12:30 AM, and there was hot food waiting. Jake was asleep when I arrived, but my friends Rob and Janika, who live nearby in Albion, ME, were there to take care of me. They carried my bike down into the dining hall, where lots of others were parked along the sides, and where Mike and Larry had arrived shortly before. I had a plate of hot food, and Janika showed me to the shower and my room. I rinsed off quickly, and asked to be woken up in an hour and a half. I didn’t sleep especially well, for whatever reason. But I knew that the first day was the easiest, and that the climbing would increase each day, so I wanted to be sure not to spend too long at the sleep stop. I left at around 3:30 AM, a bit behind Mike and Larry as usual, feeling somewhat less than refreshed. There was a neat little pedestrian bridge on the way out of Waterville, and more wee-hours fog. The early morning is often a challenging time of day for me to say the least, and I was going none too fast in my groggy stupor. Finally around 6 AM I crested a hill and saw a convenience store that was open, so I stopped for a snack and some caffeine. The stop helped some, but didn’t do as much good as I’d hoped. A ways down the road, I finally just sat down and took a nap, leaning up against a road construction sign. The nap made a big difference, and when I got back on the bike I felt much more alert and finally started to go a little faster. It was a very pretty morning actually, once the fog burned off. Awhile after that I came upon another rider by the side of the road. He’d broken his rear shift cable and was calling it quits. I tried to talk him out of it, first by suggesting that he adjust the limit screws in the rear derailleur to pick one cog, since he’d still be able to shift the front (he wasn’t too keen on doing the rest of the ride with a two speed bicycle) and then by suggesting that he call Janika and Rob, who live nearby and would probably have a shift cable to lend, but he’d already made up his mind and called his wife to pick him up. As the day went on and the route got closer to the coast, the traffic picked up. In Maine, numbered roads/state highways are generally one lane in each direction and the pavement stops right at the white line, at which point there’s a very soft sand shoulder. I’m not a huge fan of this arrangement; people drive quite fast, including logging trucks, pickups towing trailers, etc. The wide, sandy shoulder creates a visual impression that there is plenty of room, but the sand is so soft as to be pretty un-rideable. 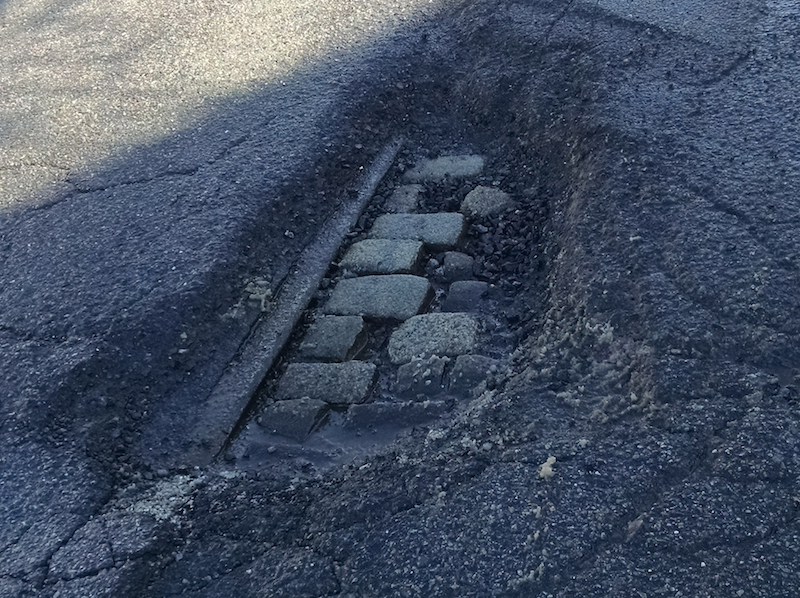 The edges of the pavement are often crumbled, which makes it worse. Generally it seems that if I actually turn around and look over my shoulder at traffic that’s coming up from behind, they’re more likely to move over and give me a reasonable amount of room (maybe it’s a subconscious signal that I’m a person, not an inanimate obstacle), but craning over my shoulder over and over for miles gets tiresome, and makes for a stiff neck eventually too. I’d been in this same area with my heavily-laden touring bike not two weeks earlier on the way home from a gig, and while it was worse on a loaded bike, it’s annoying on any bike. During the day at least, some of these Maine roads can go from peaceful, gorgeous, and idyllic to obnoxious and terrifying and then back again faster than anywhere else I can think of. Rt. 1A was particularly annoying in this respect. 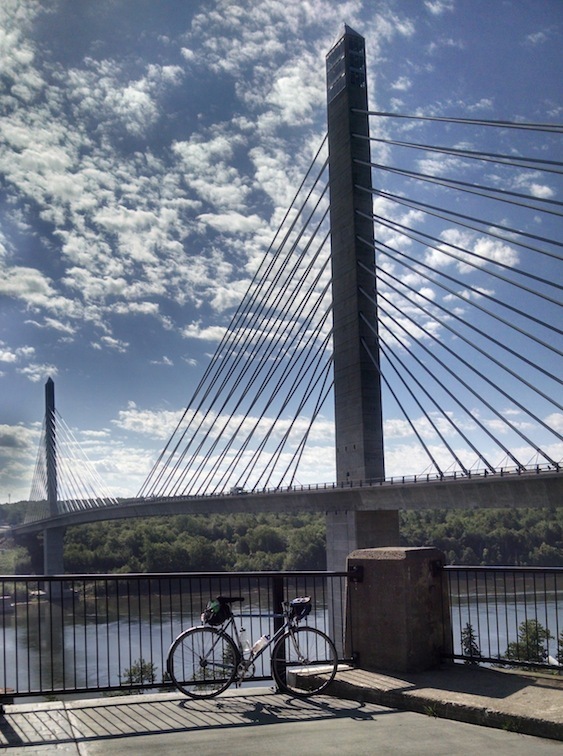 Finally, I reached the Penobscot Narrows Bridge and the point where I reconnected with my exact route from a couple of weeks before. I do always enjoy crossing this bridge. It’s beautiful, and also brand new. It carries US-1 to the island of Verona. The control in Bucksport is right after leaving Verona. Actually, two weeks previously, I’d been heading the other direction on Rt. 1 and Janika and Rob had ridden out to meet me, and Bucksport was where we connected. Mike and Larry weren’t at the control when I got there – no surprise, what with my snack and then nap. I was annoyed that I hadn’t managed to gain much time on that leg, since I knew I’d need it later on when the climbing started in earnest. But the early morning sleepies will do that to you. This convenience store, too, was a little thin for selection, but I did find myself a solid 1200 calories in a pint of Ben and Jerry’s, bought my umpteenth disgusting bottled Frappuccino (seriously, I really hate those things, but they work), and then kept on. 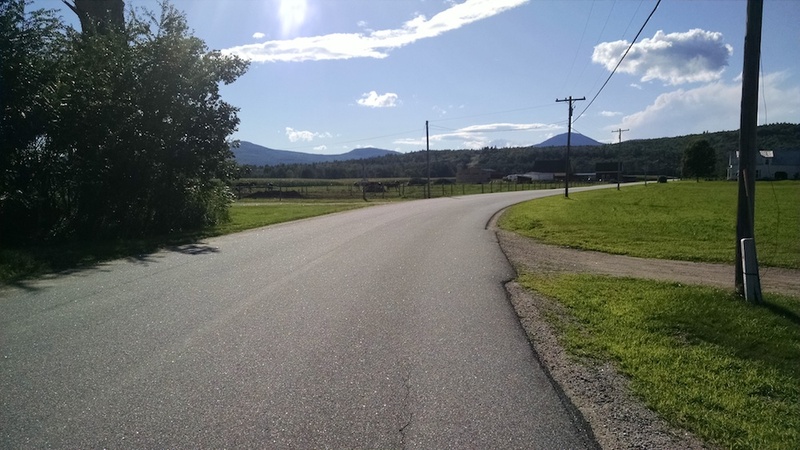 From Bucksport to Ellsworth, I was riding on US-1, a stretch of it that’s all too familiar from my annual trips to Maine with the touring bike to teach music. The road goes over a series of long rollers, and I always think there are fewer of them than there really are. I can say with confidence, though, that they do feel less onerous on a fixed gear brevet bike than on a 90-lb touring bike. Rt. 1 has a nice, wide shoulder most of the time, so although the traffic goes by very fast, the biggest problem it causes is the noise. The exception, though, is where the road adds a climbing lane on the uphills. The width for the climbing lane comes out of the shoulder, leaving a much narrower strip. There are two signs on those hills: one says “slower traffic keep right” and the other says “keep right except to pass”. These two instructions imply different treatments of the climbing lane, and the result is that everyone just spreads out into both lanes, going just as fast. So you still get passed by trucks going 60mph when the shoulder is narrowed, and that’s not really a lot of fun. Eventually I reached Ellsworth, which has a steep descent into town, and then a right turn toward Mt. Desert Island (that always strikes me as a sort of awkward name… I always want to add another “S” and envision it as a giant pile of whipped cream!). Rt. 3 on that stretch was more of that narrow road, crumbled edges, sandy shoulder, fast pickups business for awhile, but as I got closer to Acadia the traffic got a little friendlier. Generally the tourist traffic in and near the park was somewhat better behaved. It was fairly hot though, and I was still feeling kind of groggy and slow. I wasn’t making up time very well, and I needed another water stop before starting the long climb up Cadillac. Just as I was feeling cranky and thirsty and in need of a pick-me-up, I heard some calling and cheering from the side of the road. There were a bunch of people milling around, and bikes everywhere, and they were motioning for me to join them. I rolled over, and they took my bike and offered me sandwiches and cold water and a chair. They were a church group from the Midwest (I can’t remember where now ) on a bike trip. 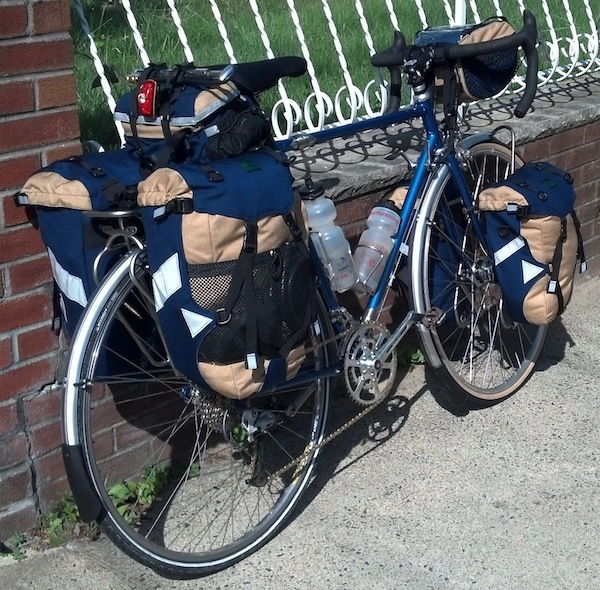 They’d started from Brattleboro, VT, and were going about 450 mi in around 8 days. Their sandwiches, cold water, and friendly conversation gave me a much-needed boost as I continued toward the mountain. The road started going uphill basically by the visitor’s center. I wasn’t near Cadillac Summit Road yet, but I was climbing already. Even on Paradise Hill Rd, I’d catch occasional glimpses of a the distant mass of the summit, and it seemed impossibly far to climb. It was a long climb, but climb I did. There was a fair amount of tourist traffic, including some large tour buses, and while I found the whole tourist-y scene a little off-putting, the drivers were polite enough and gave me plenty of space. It seemed like I’d been going uphill for ages when I finally arrived at the turn onto Cadillac Summit Road, which was still 3.5 mi from the top. But the climb wasn’t terribly steep, and I settled into a good rhythm for what felt like the first time all day. At one point a woman who’d gotten out of her car to take photos of her son climbing around on the rocks around a switchback cheered me on and told me I was almost there. It still seemed to go on for a good long while after that, though. I always try to remind myself that people shouting encouragement from the side of the road may not necessarily be very good judges of what constitutes “almost there” or of how far it really is. The sun beat down, and I climbed some more. Finally, I arrived at the summit. There was a big parking lot and a gift shop and lots of people, but the weather was clear and the view was spectacular. I sat down and took a breather, and one of the other visitors took a photo for me. A few people asked me where I’d ridden from, shaking their heads when I explained. A common question I get, when they notice that I’m riding a fixed gear, is whether that’s a requirement or whether everyone does it like that. The next question is invariably why the heck I do it like that, since a modern multi-speed drivetrain would seem to be the logical choice. I have yet to come up with a good answer, and all I can say is that I do it because I’ve been doing it for years and haven’t gotten around to changing. You’ll notice that I’m wearing long sleeves and knee warmers, despite complaining of the heat. There’s actually a good reason for this! For the long sleeves, the explanation is that this jersey is not a thermal material, it’s just lightweight summer fabric. The long sleeves are a light color and help keep the sun off, so that I don’t have to bother with sunscreen. I’d sort of rather wear short sleeves, but the long sleeves are less annoying than sunscreen, and actually keep me cool pretty well. The knee warmers are because my knees tend to rub the top tube when I climb. This isn’t a problem in dry weather, and it isn’t a problem when it’s pouring, but when it’s sort of damp, my skin wants to stick and causes lots of irritation. So at a certain point I just put on the knee warmers and kept them on. But they’re fairly thin, and don’t really feel that hot either. It just looks like I’m overdressed! The descent off of Cadillac was curvy and fun. I saw a few other cyclists riding up while I was spinning madly on the way down. They gave me some strange looks, to be sure. Descents like this always engender a bit of chagrin, because I worked so hard and it took so long to get up to the top, and then I get back down to the bottom in what feels like no time at all by comparison! 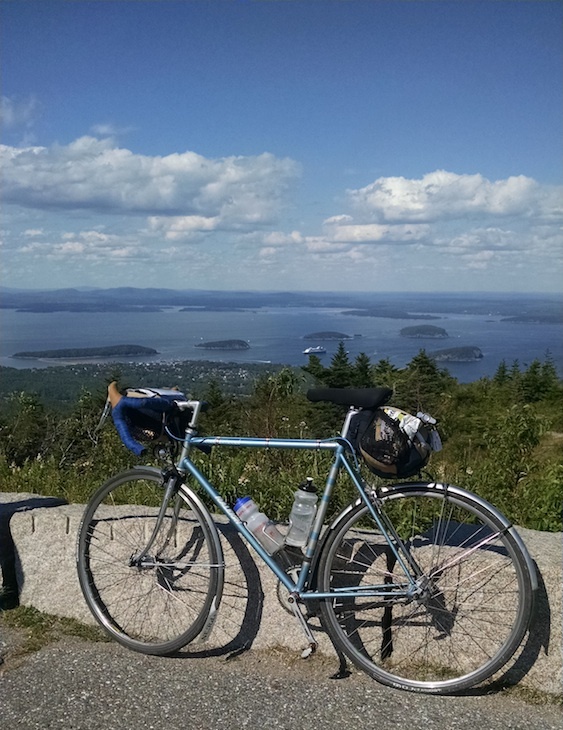 After the descent, there was a short loop through Bar Harbor. I could have done without the congestion and traffic of doing that, but I made another stop for water and iced coffee and a bacon, egg, and cheese sandwich (extra bacon). I was still feeling sort of slow and draggy, but the food and caffeine helped pick me up. Out of Bar Harbor, the route went down some beautiful gravel carriage roads back in Acadia. These were really one of the highlights of the ride. The cool shade and lack of traffic was a welcome change of pace. I should have taken photos, but I didn’t. That short section ended, and the route reconnected with the outbound version again to head back toward Ellsworth. I walked up the steep hill out of downtown Ellsworth. The setting sun was in my eyes, and I was relieved when it dipped below the hills as I rode back down Rt. 1 to Bucksport. This was now my third time on that stretch of Rt. 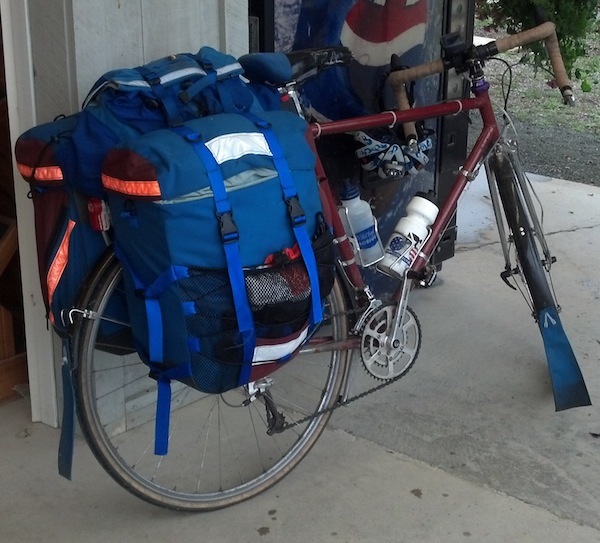 1 in two weeks; the first time was on my touring bike, on the way home from teaching in Lubec. On the touring bike, I have a low gear of 30×34, and even on the loaded bike, I don’t need to walk on this hill, although I don’t go any faster than if I did. But walking a bike that heavy is no picnic; riding it is easier! With a low gear (and a high gear) of 44×17 though, walking is worth it. By the time I left the Bucksport control, it was dark. I was tired, and it was a long trip back to Colby to sleep. 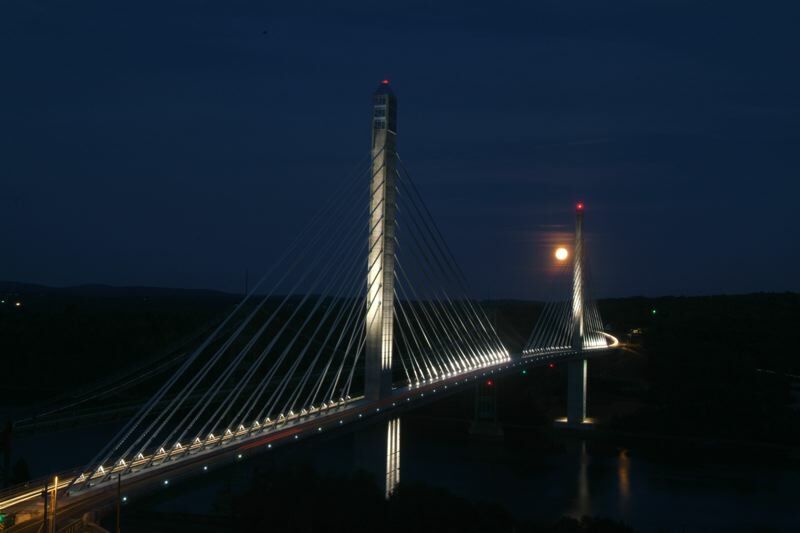 After crossing over the Penobscot Narrows bridge again, I looked behind me and saw the bridge all lit up in the dark, with the full moon centered between the two soaring pylons. It was gorgeous, and I should have taken a photo… but my phone takes crappy pictures in the dark, and I’d have had to stop and brace the phone or hold very still to get anything at all. So here are some photos I stole from the internet, to give you some idea of what it looked like. Pretend there’s a full moon between the pylons! Bridge and moon, but wrong vantage point. 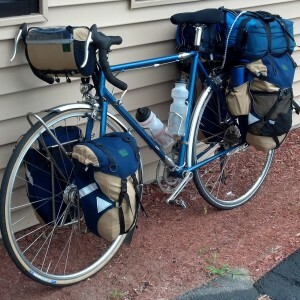 The 57-mi leg from Bucksport back to Waterville was definitely the toughest for me mentally. I really needed to make up time, especially if I wanted to sleep at the control. I was tired and kind of groggy. The roads that were pleasantly scenic during the day were pretty boring by night, when there’s really nothing to see except the little circle of the world illuminated by my headlight, full moon or not. I could have done with another water stop somewhere, and every time I passed through towns I kept a careful eye out for a soda machine. I’d have really liked to find a soda machine. But they didn’t have any of those. I finally got sleepy enough to take a nap leaning up against… something or other. I can’t even remember what it was, just that I did it at least once. I guess there were some rolling hills in there, but I don’t really remember those either. I finally made it back to Colby at around 3:30 AM, half an hour before the cutoff time. Jake was there waiting for me, as well as volunteers Sara and Gary. Mike and Larry were there, too. Not only was there hot food, but there was also cold beer! Jake had done the beer shopping and had even made sure to save me an IPA. The beer was just about the best thing I ever tasted, and it helped with getting the food down. This time when I went up to sleep, I had no trouble sleeping soundly for an hour and a half. The alarm rang all too soon, and I tried to get down some food and coffee, but as usual after sleep stops like this, I didn’t manage to get down that many calories. Finally I gave up on it and got back out on the road, for the last (and hardest, terrain-wise) day. As Jake was carrying my bike back up the dining hall stairs for me, he commented that he’d carried basically everyone’s bike up or down those stairs, and he was pretty sure that mine was the heaviest of them all. Whee, lucky me: It’s not enough to ride a fixie, I have to ride a heavy fixie, too! I don’t think it was the weight of my luggage; I don’t think I was carrying more than many other people, and the only stuff I carried with me that I didn’t actually use were the tools (only a small multi-tool, a y-wrench, a single tire lever, a few zip ties, and some electrical tape – I am not one of those people who carries a spare bottom bracket and a full set of cone wrenches!) and spare tubes, because I was fortunate enough not to get any flats. He did mention that my load was very well balanced between front and rear. But apparently my bike is not so light. I had made my sleep stop as quick as I could while still getting done what I needed to, but I still left the control with a time deficit on the control closing times. But I still needed more in the way of breakfast, and made a stop at a cafe 20-30 mi or so into the leg. I had some chicken soup with rice and some sort of quiche thing and a big iced coffee, and that perked me up quite a bit. Actually, leaving the breakfast place, I actually felt as good as I’d felt the whole ride. Of course I was still tired, and my wrist was still sore from the unscrewing-the-lid incident, I still had blisters on my fingers from so much climbing in muggy weather, still had a few more saddle sores than usual due to wearing shorts that are too small, etc, but still, I felt like I had finally warmed up and hit my stride. Sometimes you just feel like it takes a long time to warm up, and sometimes 450 mi. Go figure. But it was a good thing I did, because the hard parts were still to come. There was a series of quite steep rollers, followed by a 700-foot climb that seemed to come out of nowhere. At one point, someone called from the side of the road that I was halfway. He said it in an encouraging way, but as I already felt like I’d been climbing for way longer than I was expecting, halfway was NOT what I wanted to hear at that point! Unfortunately, his estimate was spot on. Awhile later on the same climb, Jake passed me in his rental car, and pulled over to see how I was doing. Not only that, but he’d been shopping! At the sleep stop, I’d mentioned that so far the convenience store controls had been fairly thin for selection, and often didn’t have the things that I liked. Foremost on my list were V-8, and those little Starbucks cans of espresso with cream and sugar. Those cans are like magic in the middle of the night, and they aren’t even that heavy to carry. If I were smart, I’d buy some in advance and carry some along and keep some in my drop bag. But I’ve apparently not gotten smart to that strategy yet. Anyway, I got a big delicious drink of V-8 and I took a couple of those magical cans onboard to get me up the big climbs before continuing up, and finally descending into the control in South Paris. Shortly after the control, the route passed Pennesseewassee Lake. As I looked out over the water, I could see some weather over the mountains in the distance. After the lake, I hit a bunch more steep rollers between Norway and Sweden (must be all those fjords! ). They were relentless, and I walked up a couple of them. It was there that the weather I’d seen caught up with me in a short but torrential downpour. The temperature dropped, the wind howled in, and the sky opened up like a fire hose. There was even hail for a few minutes! It didn’t rain for long, but it rained hard enough to ensure that I was soaked, and my feet would be damp for the rest of the ride. As swiftly as it had come, the Sturm und Drang ended and the sun came back out. Steam rose from the pavement. I kept looking behind me to see if there was a rainbow, but either there wasn’t or the trees lining the road didn’t let me see it. Shortly after that, the rollers gave me a reprieve until crossing the line into Conway, NH. I made a quick stop at one of the last convenience stores before the biggest climb of the ride, then headed into White Mountains National Forest and up the Kancamagus Highway. The sun was low and in my eyes as I continued west. Fortunately the mountains start shading it from view long before it reaches the actual horizon. It’s over 20 miles from the park entrance to the top of the climb. I went at a slow but steady pace, and as the sun set the traffic decreased. It’s not a steep climb in the east-to-west direction (in the 5-7% range I would say), and I got into a pretty comfortable rhythm. I’m not sure how long it took to reach the top, but it was full dark by the time I did, and the moon was up. When I reached the scenic overlook at the top, I heard a woman calling out, “Yeah! You made it! Good for you!” I didn’t realize she was talking to me, until I realized that except for the person standing next to her, there wasn’t anyone else around. I pulled into the overlook (which I’d have done anyway) and she gushed that she and her husband had seen me on their way up, and she thought, “Oh that poor man! (oh, sorry, I assumed you were a man, no offense!) That looks like such hard work!”. She said they lived nearby, and had driven up there to look at the moon, which was one day past full and was big and bright in the relatively clear night sky. The moon really was gorgeous; my cell phone photo can’t possibly do it justice. It was bright enough to see the faces of the couple I was talking to, and bright enough to cast real shadows on the ground. I enjoyed the brief chance to chat, especially with someone as bubbly and upbeat as this woman was. Her husband didn’t say nearly as much, although that would have been hard. 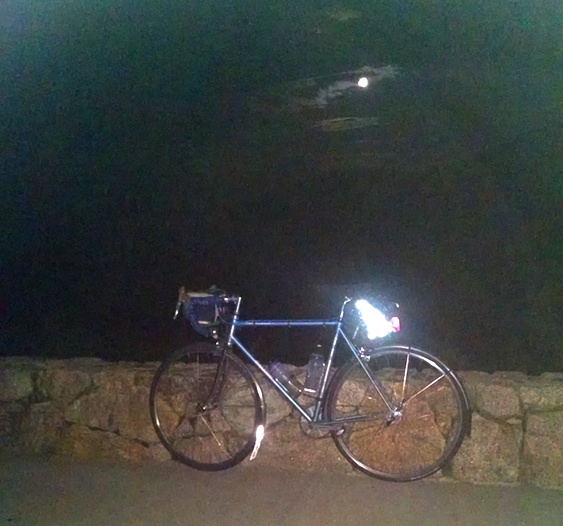 The overlook was nice and all, but time marches on and so do brevets. So on I went. It was only 13 miles of spinning like mad to get me to the Price Chopper control in Lincoln. I managed to make it in time, and even managed to gain some time. I both love and hate grocery store controls. I love that there are finally more choices, but hate that it always takes me longer to figure out where things are, figure out what I want, and take care of what I need to do. They didn’t have any hot food anymore by the time I got there, but I found some cold soup and a microwave to warm it in. I didn’t wait for it to get very warm though, before eating it as quickly as I could and refilling my bottles, ready to press on. While I was in the store, there was a quick torrential downpour outside that had mostly finished by the time I was ready to leave. 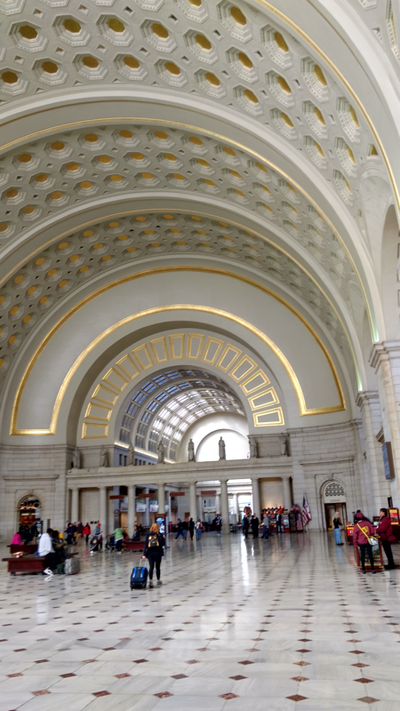 Also notable were the people I saw going in and out as I sat in the vestibule eating my soup. It was like Interfaith Night at the Price Chopper. There were a couple of families dressed in orthodox Jewish style (both with babies in strollers… I always sort of wonder what someone’s day has been like if I see them in a store with a baby at some weird hour of the night), a couple of families dressed in Muslim style (more people bringing small children to the grocery store at odd hours), and a couple of people with Sikh top knots. And a guy with lots of tattoos, of which a couple were varieties of crosses, but you expect tattoos in the middle of the night. It was still dripping outside a bit when I left. The next leg was only 32 mi, and I had over four hours to do it in to make the closing time. But of course, the first thing on this leg was the climb up Kinsman Notch. This one isn’t as long as Kancamagus, but it’s steeper and darker and I was sleepier, so I got off and walked a bit. At one point I also pulled over and took a nap leaning up against a “White Mountains National Forest” sign. 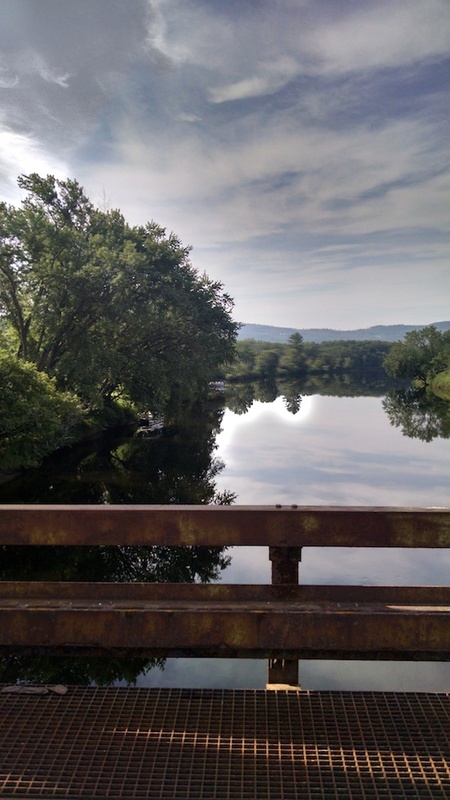 But finally I reached the top and started the more gradual descent into the penultimate control, in Bradford, VT, right on the Connecticut River. It was sometime along that stretch that I realized I didn’t have quite as much time as I thought! I’d been doing the math on the closing time of the Bradford control, and the finish time, and realized the problem. The control closing times are based on the required minimum speed for the full distance that the route actually is, in this case, 635 mi. The finishing time is calculated based on 1000km, or 621 mi. That’s a 14 mi discrepancy, and if one were not careful and were up against closing times on every control, one would have to make a much higher average speed on the last leg. And the last 34 mi was much more uphill than down. Uh-oh. The sudden realization that I was under more pressure than I thought roused me somewhat, and I focused on keeping the pace up. I arrived at the Bradford control a good bit ahead of closing, and got in and out of there as fast as I possibly could. I did my best to keep the pace up, but sleepiness was getting the better of me. Once or twice I stopped for a “standup nap”, where I didn’t bother to even dismount but “napped” by crossing my arms over the bars and putting my head down for a few minutes. It was all I could take the time for and it wasn’t much, but it was enough. As I rode into dawn, the morning light plus the realization that I wasn’t going to make it in time if I didn’t hurry, plus the motivation to be done helped wake me up. It was actually a glorious morning, and the Vermont countryside was really gorgeous up in those hills. Would have made nice photos, but damned if I was going to be bothered with that. Plus, my arm had gotten more and more sore. It basically wasn’t a problem while riding unless I moved it in a bad way while moving my hands around on the bars, but all kinds of other things irritated it, such as getting things out of my back pockets or fishing around in my handlebar bag. So that made photos more difficult, which is another reason I don’t have more of them. Those last few climbs felt like cruel and unusual punishment, tantalizing me with how close I was but slowing me down at the same time. But finally, I made it into the Comfort Inn with 15 minutes to spare. Being in a huge hurry to check in and get my card stamped, I walked right through the hotel lobby without looking at anything (like the signs that would have told me where to go) and went straight to the hotel room we’d been told at the start that we’d have at the finish. There were no bikes around, things were very quiet, the door was shut, and there was no sign, but that was the room, so I knocked. A woman in a nightgown opened the door and sighed and told me she didn’t know where we were supposed to go, but good luck anyway. She didn’t look that surprised to see me… apparently, the poor lady had been woken up quite a few times by randonneurs who thought they knew where they were going. In a panic to check in before 7, I called Jake. He was in a different room; the hotel had promised us the same one, but had accidentally given it to someone else. 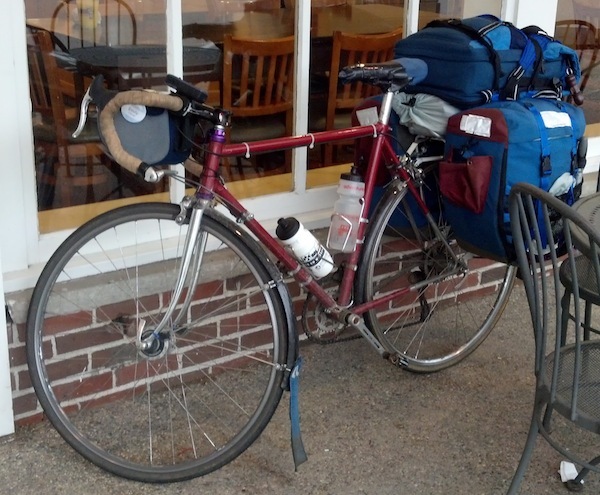 Jake had put up signs in the lobby, but in my brevet-addled stupor I missed them completely. I found the right room, where Jake was waiting, along with NER’s newlywed president Dan Greene and his wife. Mike and Larry were there too, having finished about 15 minutes before. The smell of cooking butter filled the room, and it turned out to be coming from a griddle from which I was served fresh scrambled eggs and pancakes. So, thanks again to all the volunteers who made the ride possible. I’d definitely do this ride again if it were offered, and would highly recommend it to anyone looking for a taste of New England that’s a little bit off the beaten path. Maybe one of these times I’ll even get a light bike with gears. But then again, I think I’ve said that every year for ten years, and I haven’t done it yet. You might have heard that we’ve been getting quite a bit of snow here in the Boston area. Snow can be tons of fun to play in and ride in, on the road and off. Especially with the recent popularity of fatbikes, “gravel grinders”, etc, there have never been so many ways to go out and play in the snow on a bicycle. 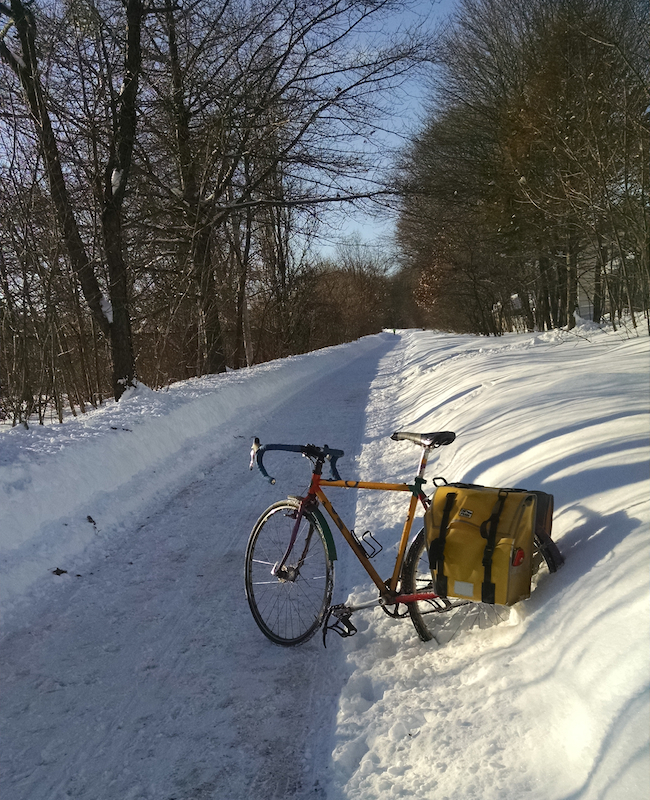 But with the havoc all this snow has wrought on Boston’s transit system, I thought this would be a good time to write about how and why to just go about your regular business around town on your regular commuting bike. 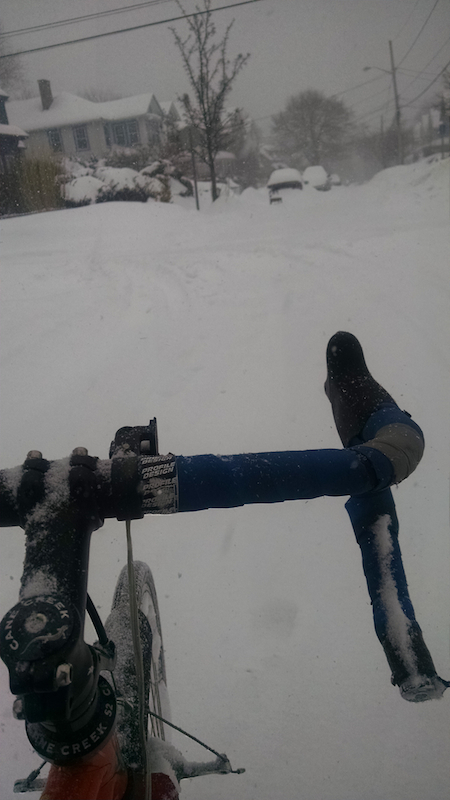 The first question people always ask me when I tell them I get around entirely by bike is always, “but what do you do when it snows?” The answer is that I mostly do the same things I usually do. 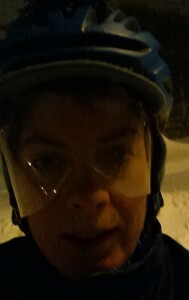 And that actually, the worse the snow gets, the greater the advantages of getting around by bike! How could this be true? 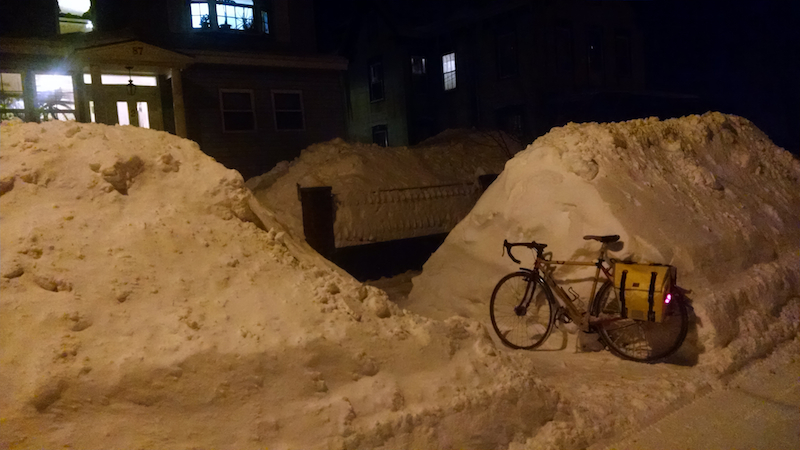 For starters, you don’t have to dig a bicycle out of its parking space. 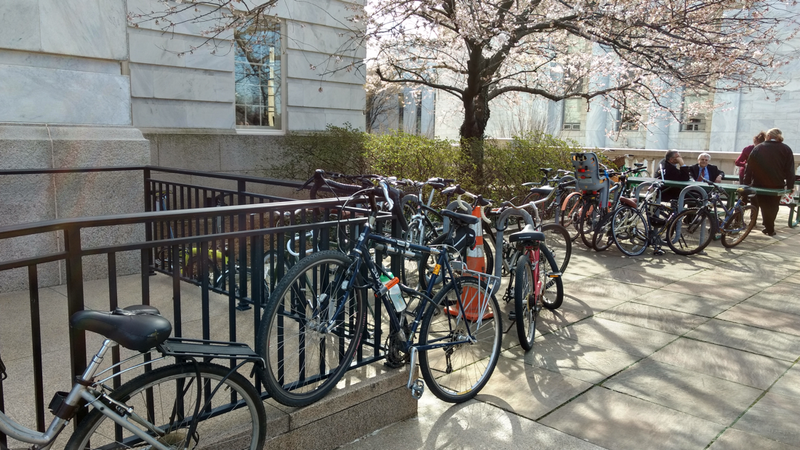 Even when bike racks get buried, you can usually find something to lock up to, whereas finding a clear parking space for a car can be a real problem. 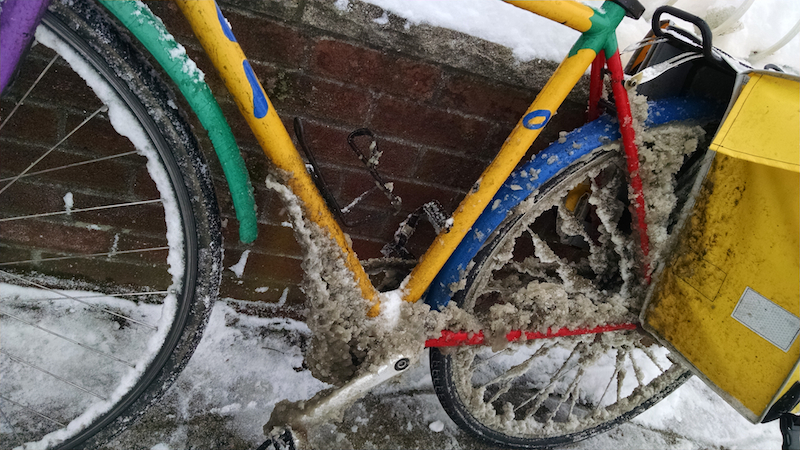 If the snow gets worse while you’re out, at the very worst you might have to walk your bike some of the way, but you won’t actually get stuck. You won’t be stuck behind someone else who’s stuck, and if the traffic gets completely blocked you can carry your bike around it if you have to. When traffic slows to a halt, it will still slow you down substantially if you’re on a bike, but not the way it will stop you in your tracks if you’re in a car. Walking is difficult because sidewalks may not be cleared well, or you might not be able to reach the corners. Buses are slowed down right along with the rest of the traffic, and standing still at a bus stop or train station in the freezing cold for long periods of time is way, way worse than riding or walking where at least you’re moving enough to stay a bit warmer. And all that’s without even mentioning the disastrous mess that the neglected, antiquated public transit system around here has become because it just couldn’t cope with the barrage of winter storms we’ve had. The entire system has shut down completely a number of times, it has been running on badly curtailed schedules, and looks like it isn’t going to be able to restore normal service for another MONTH. Needless to say, a bicycle is much more reliable. But… is it safe? My own opinion (and this is just my opinion based on personal experience, not a scientific study and your mileage may vary as always) is that for the most part, when there’s snow on the ground it’s probably no more or less dangerous than riding around town any other time. The exception to that is actually during and immediately after a big storm. I’ve heard a number of people say they’ll mostly ride around town in the winter, but don’t during those times for safety reasons. To me, this is backwards. Those are the times when I really do think that it’s actually SAFER than normal, because there’s no traffic. There are snow plows and you have to watch out for them and stay out of their way, but if you’re paying attention that isn’t too hard. It’s certainly easier than staying out of the way of every road-enraged nutcase on a cell phone during normal rush hour. Your risk of a minor spill at a low speed onto a relatively soft or smooth surface is certainly higher, but your risk of getting doored, right-hooked, t-boned, sideswiped, etc, by someone going fast is much, much lower. Case in point: This road is normally full of enough traffic to make it the bane of my existence on a normal day. These photos were taken right after snow storms, at times that would usually have a fair amount of traffic. In fact, I find that the worst driver behavior happens when the roads are getting clearer and things are starting to get a bit more back to normal; that’s when people are losing their patience with the road conditions and want to drive just as fast as in good weather, but there’s still enough potential for snow on the road that they can get into trouble because of it. One other thing to point out that has become a big issue this year (although it usually isn’t to this extent): At this point, the snow piles in many places are taller than an adult, especially at corners and next to driveways that have gotten shoveled out. So that means that you can’t see what’s coming out of corners, driveways, side streets, and in some cases even parking spaces. People have to advance way past the normal stop line in order to see if the coast is clear. This makes it a really, REALLY bad time to hug the right side of the road. At least on a bicycle you’re up a little higher and can see a little better than most drivers can, but with a lot of these piles, you’d need an extra-tall tallbike to be able to see over them. So take the lane and be alert. But what about the road surface? Don’t you slip? This is my street. It’s been awhile since we’ve seen much of the pavement surface! 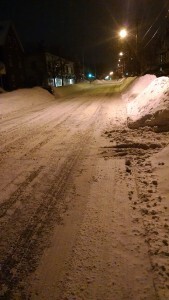 Road treatment for snow varies widely from city to city. In the Boston area where I live, they’re generally pretty good at keeping the roads plowed. It’s fairly rare that I find myself actually floundering in deep powder. That said, they’ve been pretty overwhelmed this year, so while the roads are generally perfectly passable by bike, they’re down to a fraction of their normal capacity, so there’s not a lot of room. See above about why you do not want to have to drive around here right now. 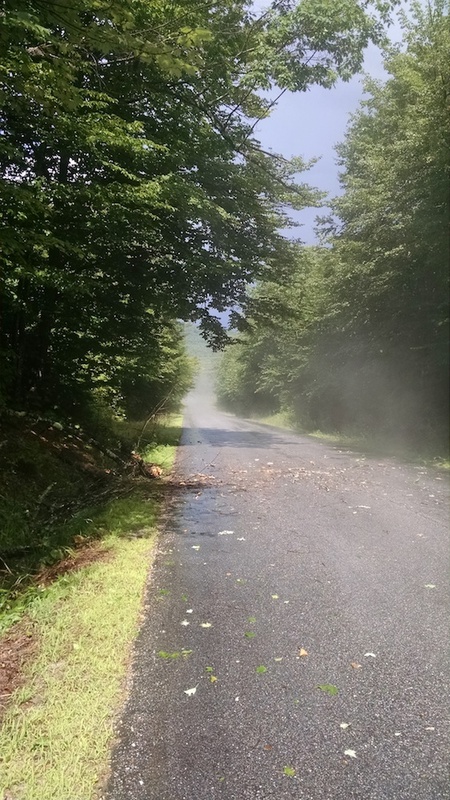 They’re even doing a better job than they used to of keeping bike paths clear and passable. Bike paths are often more likely to have slippery and icy patches than roads because they don’t get as much sand and salt, and they don’t have cars to melt ice and sweep snow to the side. But on the flip side, they aren’t crowded and the only other people you see using them are the experienced riders who are out all year and are generally reasonably polite. No rollerbladers, strollers, kids, or crowds. 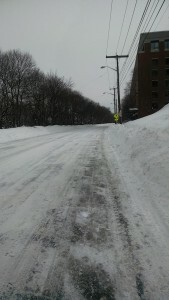 Neatly plowed Minuteman Bikeway. In this photo, there’s still enough of a thin coating of snow over whatever ice is underneath to have good traction. You wouldn’t want to race a crit over it, but for cruising on a deserted bike path it’s just fine. But yes, it can be slippery. Studded tires help quite a bit, and are a good idea. But they’re not required. If you need to go somewhere and don’t have studs on your bike, or you just never get around to putting them on, that doesn’t have to stop you. My own strategy with my commuter bike is to use parts that can take a beating, and never bother with cleaning or adjusting anything except when it wears out. I’m far too lazy to change my tires for the winter so I never bother with studs, and I’ve been out riding and getting where I need to go every day, including during every single snowstorm we’ve had this winter. I’m not necessarily recommending this strategy – studded tires are made for a reason and they do what they’re supposed to do. They aren’t a panacea, but they help. Also, skinny tires aren’t the end of the world. In some cases they even sink through more than wider ones. I’m not recommending them; just saying that they aren’t an excuse. • First and foremost, realize that it’s going to take you longer than usual, and slow down. Actually, this is good advice if you’re driving in the snow, too. On top of that, sometimes it’s just a slow, hard slog to push your way through snow, kind of like how running on sand is hard work. And it gets harder when snow gets packed up under fenders and brakes and so on, too. Just relax and be patient, and you’ll get there. • Let your forward momentum keep you going forward. The wheels can slip around a little without taking you down as long as you don’t freak out and overcompensate. 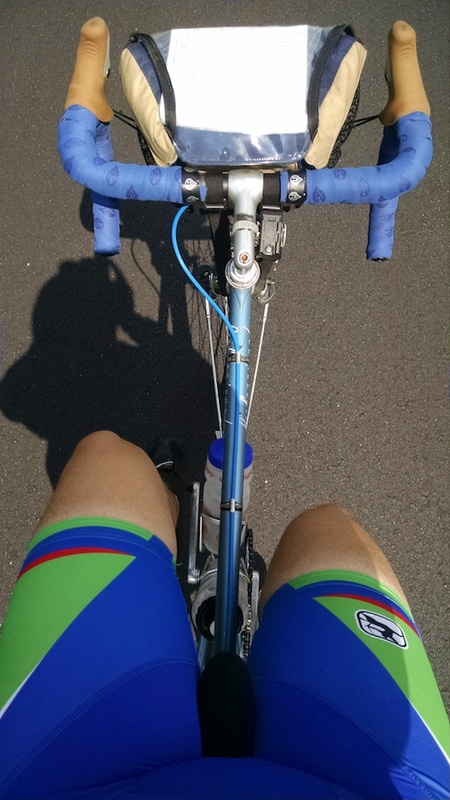 Stay loose, pedal smoothly, and don’t lock your elbows. • If you have to ride over a patch of actual ice, do not try to slow down, speed up, or steer while you’re actually on top of it. Keep going at a steady speed in a straight line and you can make it over just fine. That means that if you are going fast, slow down BEFORE you get to the icy patch, not while you’re on it. • On uneven/unpredictable surfaces like packed ice and snow, it’s helpful to get more weight onto the front wheel. This helps keep traction in the front, and helps it cut a little farther in. You can do this by leaning farther forward, or by getting out of the saddle. Incidentally, it does not necessarily mean putting more weight on your hands; if you lean forward your center of gravity moves forward and puts more weight on the front wheel, regardless of whether your upper body is being supported by your hands or whether it’s being cantilevered against your pedaling force. • Just like a car can drive up a slippery hill as long as the wheels are turning slowly and steadily but will slip and slide back down if you get impatient and try to accelerate, the rear wheel of your bike can spin out if you stomp on the pedals. Apply force evenly and slowly, depending on how much traction you have. • But in some cases, your best bet is to just use your momentum to plow through. In particular, when a snowplow or someone digging out their car has left a big pile of snow across the road, you can usually just shove through it, even if sometimes it looks like you can’t. • Take the lane. Take the space that you need. Light yourself up like a Christmas tree, especially when visibility is bad. But be polite, and do your best to stay out of the way of plows, road crews, utility workers, etc, so they can do their jobs. • Lower than normal tire pressure might help, as long as you can ride gingerly over hidden bumps and holes. Hoo boy, do we have a bumper crop of giant potholes this year! The next question is what to wear. I won’t say too much on the topic because especially where transportation riding is concerned, you’ll get a different answer from everyone you ask. But in general, layers are good. 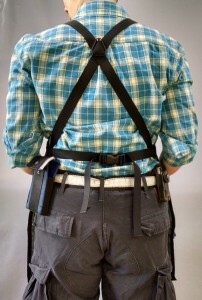 My personal approach is as follows: In the winter, my normal everyday outfit is black cargo pants with a flannel button-front shirt, sometimes a vest or sweater or fleece, and insulated/waterproof work boots. I wear a non-insulated jacket and add layers under it as needed. For temperatures below around 20°F, I like to wear some variety of long underwear. On the bottoms I prefer something along the lines of cotton or flannel pajama bottoms rather than tights or leggings, because they move with my pants better than a tight layer against my skin that tugs at my pants. On the tops I wear technical undershirts (which I always look for on sale) or T-shirts, or sometimes both. For gloves, I’m a bit weird – my hands generally get warm when I’m riding as long as my core is warm; I usually wear a pair of those stretchy one-size-fits-all acrylic knit gloves they have at pharmacies for $2 down to around 30°; down to around 10-20° I wear two pairs of them. When it’s colder than that, I either wear three pairs or resort to “regular” winter gloves. I like the knit cheapo ones because they make it easier to do things like get my keys out of my pocket, and because they let sweat evaporate. For most people, figuring out what to wear takes some trial and error. And it depends on how clean and polished you need to look when you get where you’re going. But you can probably put together enough layers from what you already have to get yourself around, between regular “street” clothes, bike clothes, ski or other activewear or whatever. And at least you don’t have to dress quite as warmly to bike around town as you do to wait for a bus that might be 45 minutes late. So, now that you’ve figured out how to ride and what to wear, what do you do about the mess? Winter riding is really sloppy. There’s no way around that. There’s sand and salt all over everything. That stuff gets caked on like cement and makes a big mess when it melts. Aside from trying to knock off as best you can before bringing the bike inside and putting down a tarp to park on, one way to clean off some more of it is to use a pesticide sprayer. Keep a sprayer full of water inside the front door and use it to hose off the worst of what doesn’t come of just by bouncing the bike or kicking at the crank arm. A word to the wise, though: don’t do the spraying on the front porch, unless you want to go ice skating down the stairs! The conscientious mechanic in me would tell you that of course sand and salt are terrible for components and frames and that you should meticulously clean your bike after every ride. Well, that’s fine for a nice bike that you ride for fun on the weekends. But when you just got home after a long day at work, you’ve got emails to answer, groceries to put away, boots to take off, etc? Umm, no. You do your best to not make a mess, maybe squirt some lube on the chain from time to time, and maybe give it a good cleaning when spring comes. Or not. 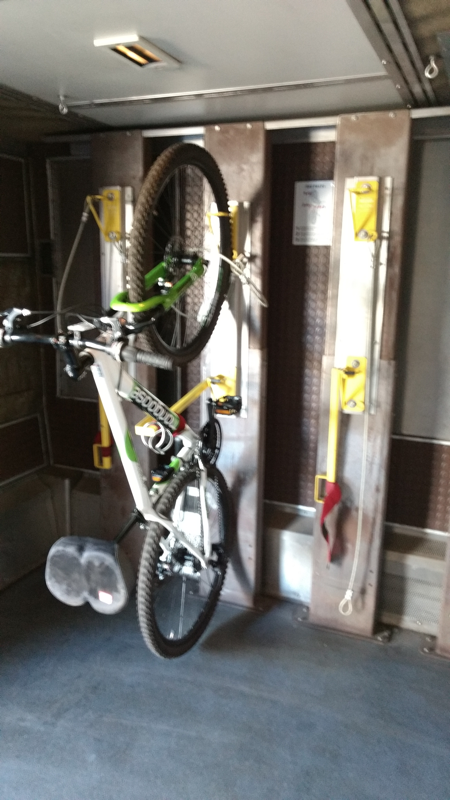 This is another good reason to choose simpler, more robust drivetrains for commuter bikes. You can get away with all kinds of neglect on a fixed gear, singlespeed, internally geared hub (depending on the model and its seals and so forth), 6-speed freewheel with friction shifters, etc. Go for sturdy, inexpensive parts and figure you can just replace them at the end of the season if you need to, although you’ll also find that those drivetrains can tolerate a lot more wear before becoming unrideable than 9, 10, or 11-speed ones. Grime and corrosion maybe don’t exactly make for a smooth, whisper-quiet drivetrain. But remember about how no one’s going anywhere fast anyway. So, to make a long story short: You can get around town by bike in the snow. It has its annoyances, but in many ways it’s still better than any alternative, and it helps stave off cabin fever. Be patient, be careful, be polite, be persistent. 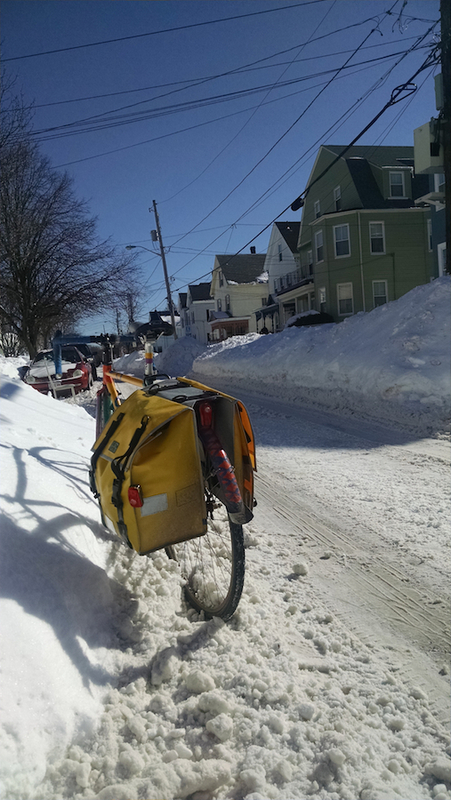 Sometimes it’s a slow, messy slog, but it beats the heck out of waiting for the bus or digging out a plowed-in car. P.S. As an aside, you may have noticed the yellow panniers in all of these photos. 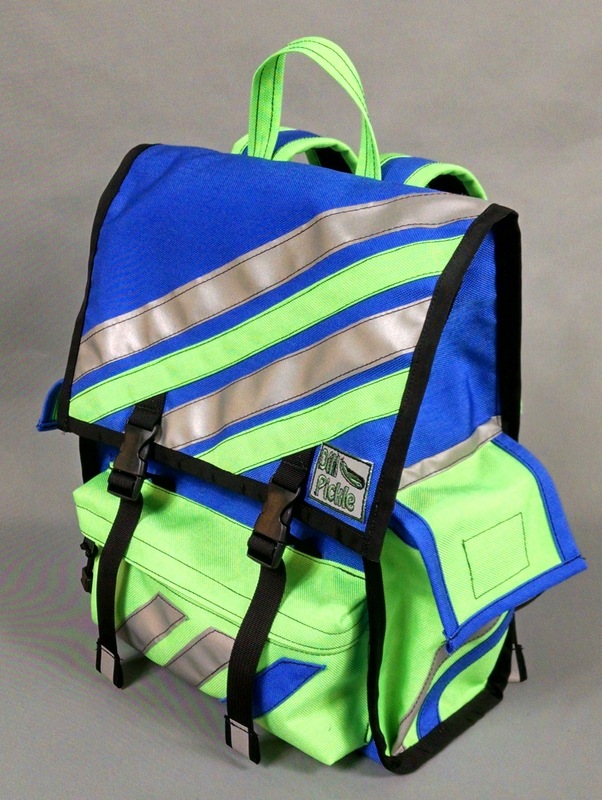 This is a new city pannier model that’s in the works, and will be available this spring. Stay tuned for more on that! P.P.S. Folks keep asking me why my front fender is so stubby and doesn’t have a mudflap. It’s only because the fender broke awhile ago and I never got around to fixing it. So, not for any good reason. She used a whole can of Easy-Cheeze.